If you want to see as much of Europe as you can in one visit then a Eurail Global Pass is the ideal way to do it. What is the Eurail Global Pass? The Eurail Global Pass covers train travel across 28 countries in Europe with varying days of validity. Passes range from 5 days within 1 month, up to 3 months of continuous travel. The pass is only available to non-European residents (European residents can travel with an Interrail Pass). For more information read my complete guide to Eurail Passes. How much train travel can you do in one month? 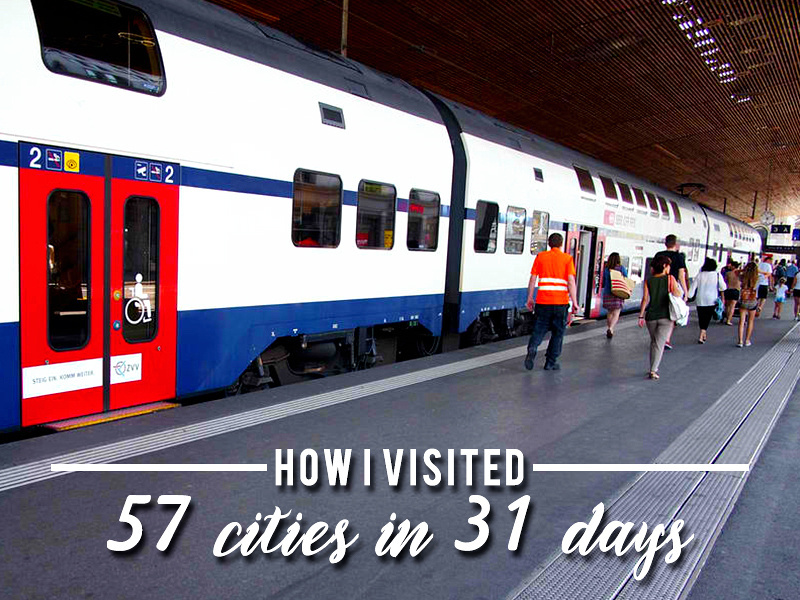 I was provided a Eurail Pass from Eurail.com to test out, so I went about seeing how many places I could comfortably visit in one month. I was not given any instruction about what to blog about, or given an itinerary. This post lists how I did it, what worked for me, and the mistakes I made on the way. In the end I visited 57 cities in 13 countries over 31 days. That might sound crazy, but it was easier than I thought it would be. Rather than being rushed I found this trip to be relaxing. That old saying of “getting there is half the fun” is true when travelling by European trains. I averaged about four hours a day on the trains, which I spent reading or enjoying the scenery. With most train stations being centrally located there was no need for bus rides into town like you need when arriving by plane. I planned my accommodation to be near the stations which enabled me to save time in the mornings. This post covers my itinerary and how much I got to see in the space of one month. I will have another post covering the details of travelling with the pass, including which pass (if any) is right for you. My itinerary was shaped by trying to visit as many places that I haven’t been to, along with crossing paths with friends in four different cities. I used to be based in Europe so I have already been to most of the capital cities, so I was interested smaller cities. I dubbed this trip the secondary cities of Europe tour. Even though you can just jump on to most trains without a reservation (apart from the high-speed and selected intercity trains) you still need to make a plan to get the most out of your pass. The time of year you go is also a consideration. I was initially hesitant to travel in July as it’s a peak travel month. This turned into my benefit though as the daylight hours are long in Europe (especially in the north). This made getting up early much easier, and I got more out of my travel day in the evening. Where you start and finish is another important choice. Obviously if you already have flights booked you would start there. I would pick a start and finish point at two cities you want to spend more time in. That way you won’t waster any travel days. With my start and finish points determined, I chartered an itinerary to new destinations. I did stay in some familiar hub cities when it worked out to be cheaper or more convenient to stay there. This is my complete itinerary broken down by day. I listed the country when I enter it, and bold being the first time in the trip. I started my trip in Amsterdam mainly because there was a cheap bus from London (Eurail does not include the UK). That, and any excuse to visit Amsterdam is a good one. I have been here several times before so I just stayed for the night. After validating my pass at Amsterdam Centraal my journey officially began. 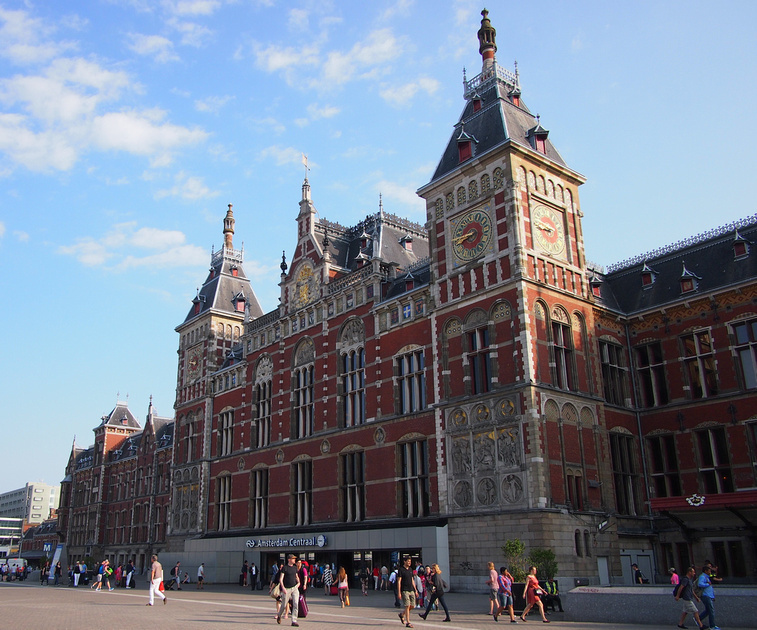 I know I’ve said this about other stations, but Amsterdam Centraal is one of my favourite train stations in Europe. Cwetainly one of my top 10 stations in the world. 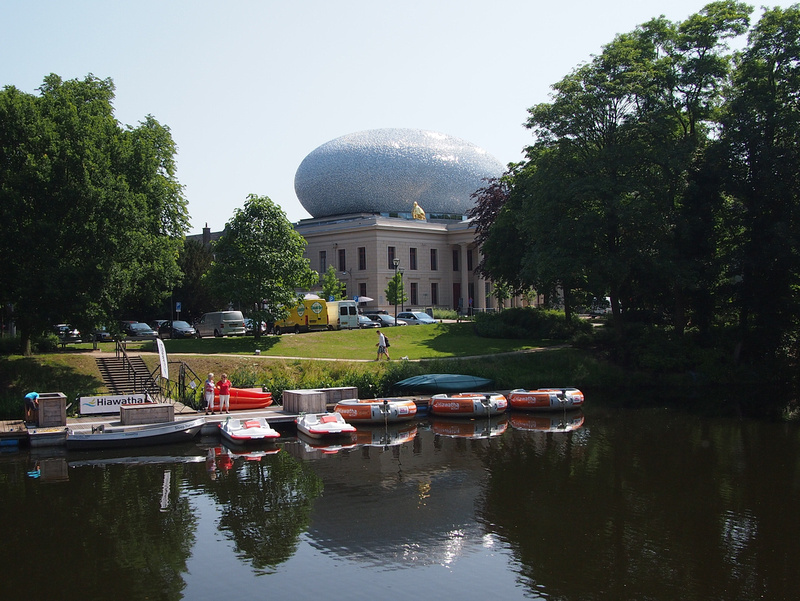 My first stop was in Zwolle; a place I had never heard of hitherto this trip. I looked it up and read that it has a medieval centre set inside a defensive canal. Sold! The old town area is a ten minute walk from the train station and the town was small enough to make it a short stopover. While I enjoyed the medieval remnants my favourite building was the Museum de Fundatie. This museum is has a modern extension on a neoclassical former courthouse. This kind of architectural mash-up is something that European cities do so well. 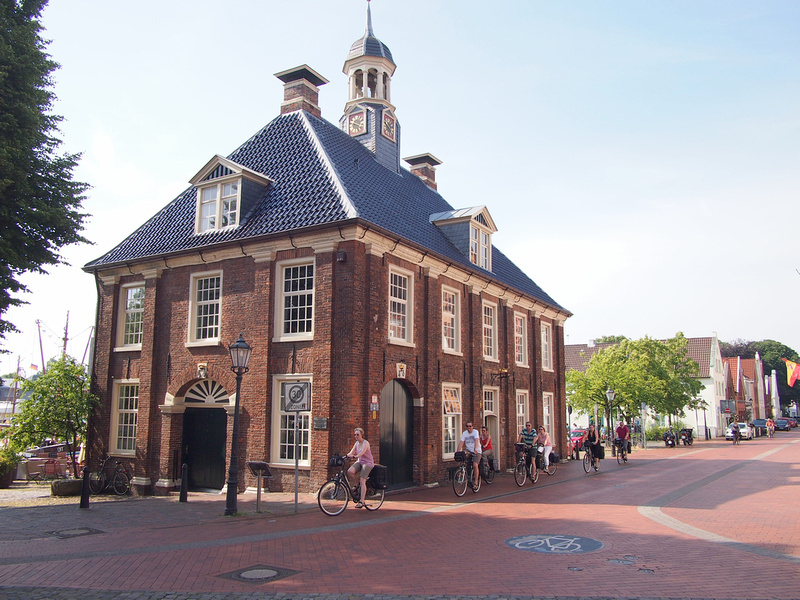 Groningen is a city in the north of the Netherlands. I have met a few Groninger’s in my travels and they always talked about what a cool city it is, so I figured it was time to visit. Groningen has a combination of old buildings and canals, and there is a big student population which adds to its youthful vibe. I found a place to stay on Couchsurfing and got to hang out with some fun people while I was here. My train out of Groningen terminated at Leer, just over the border in Germany. Rather than continuing on I went for a wander for an hour before getting my next train. My next stop was at Bremen, which is a good hub for getting around the rest of Germany. 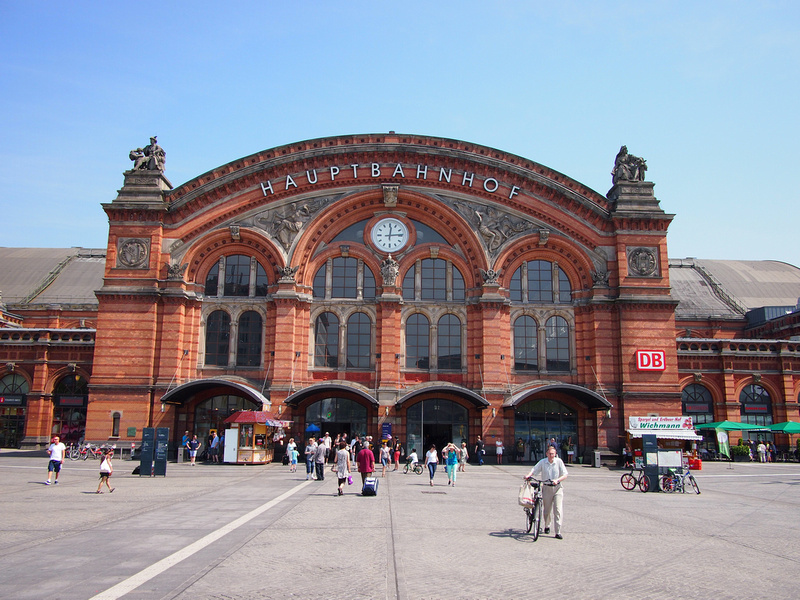 In my travels around Europe I would have to say that German train stations are my favourite. Bremen Hauptbahnhof is certainly one of the good ones. 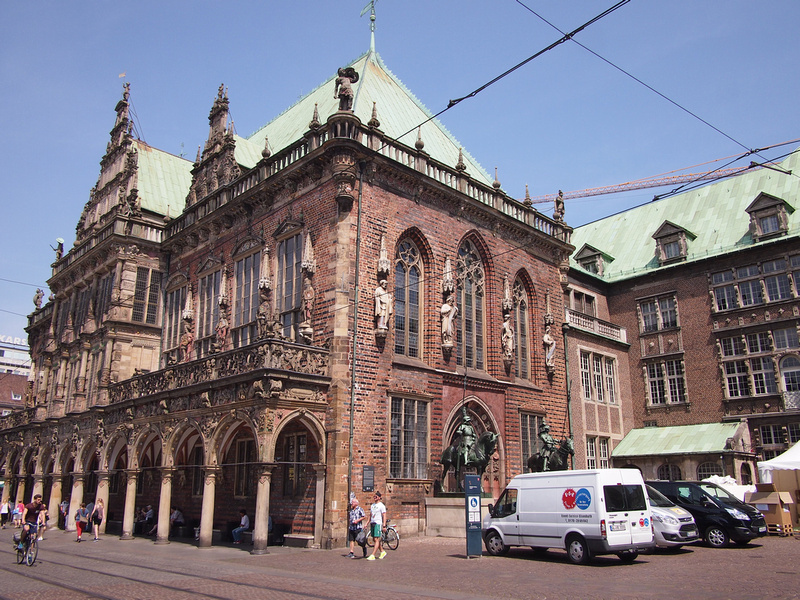 I had heard that Bremen wasn’t worth visiting but I like to give every big city a chance. I’m glad I did because there are some amazing old buildings here that somehow survived the war. My final destination for the day was Hamburg. I’ve been twice before so it didn’t exactly qualify as a new city. 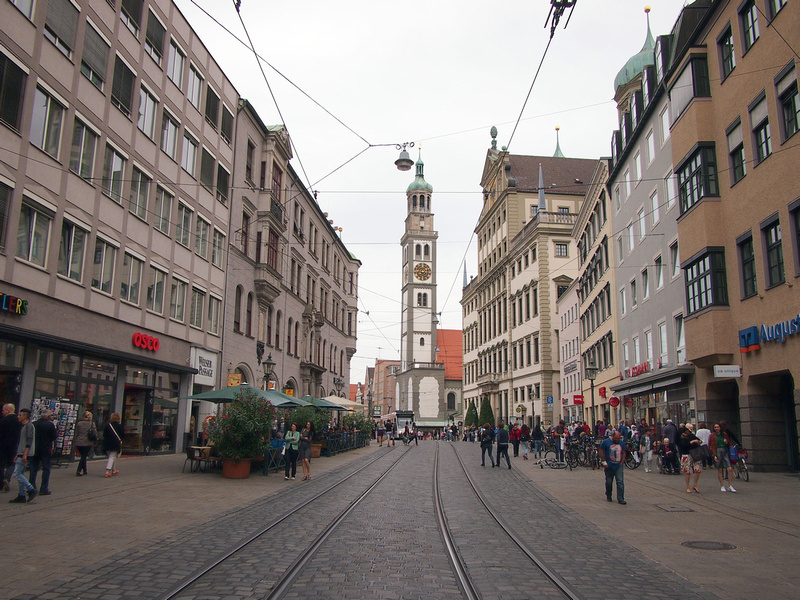 It is a city worthy of a revisit though, and it has the best accommodation options for backpackers in northern Germany. 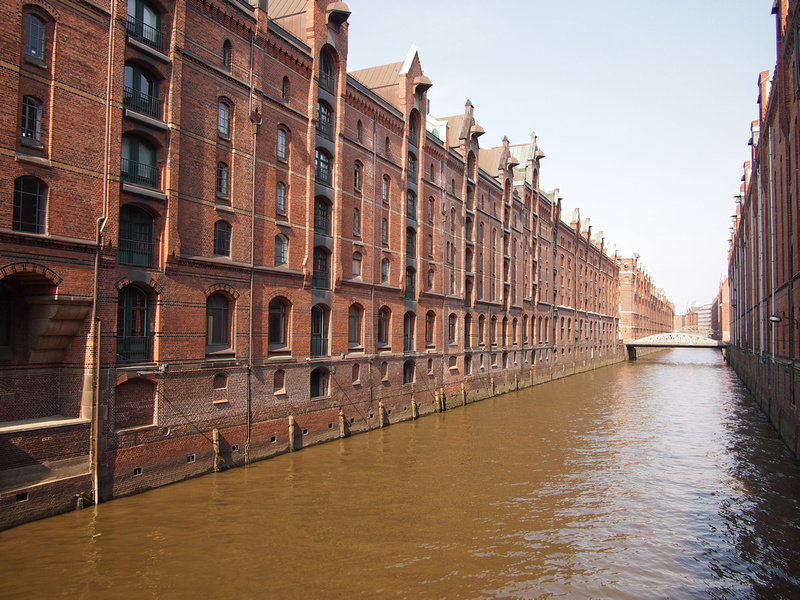 My favourite place to visit in Hamburg is the Speicherstadt, the old waterfront warehouse district. The Speicherstadt (city of warehouses in German) is the largest warehouse district in the world built on timber-pile foundations. Knowing how much of Hamburg was destroyed in the war it’s amazing to see so much pre-war industrial architecture that survived (around half of the warehouses were destroyed). Today this watery warehouse district still functions as actual warehouses, alongside museums, offices and apartments. The Speicherstadt is now listed as a UNESCO World Heritage Site. I stayed at the Generator Hostel which is the ideal Eurail hostel as it is right near the train station. For most of my trip I tried to find accommodation as close to the station as possible. That way I could dump my bags and go exploring, without having to navigate my way through the city on public transport. My first stop for the day was in Hanover, where I had an hour and fifteen minutes to wait for my next train. Rather than wait at the station I went for a walk, which was just enough time to visit the most important sites of the city. I had a similarly tight schedule in Magdeburg but I was only there for one reason; to see The Green Citadel of Magdeburg. 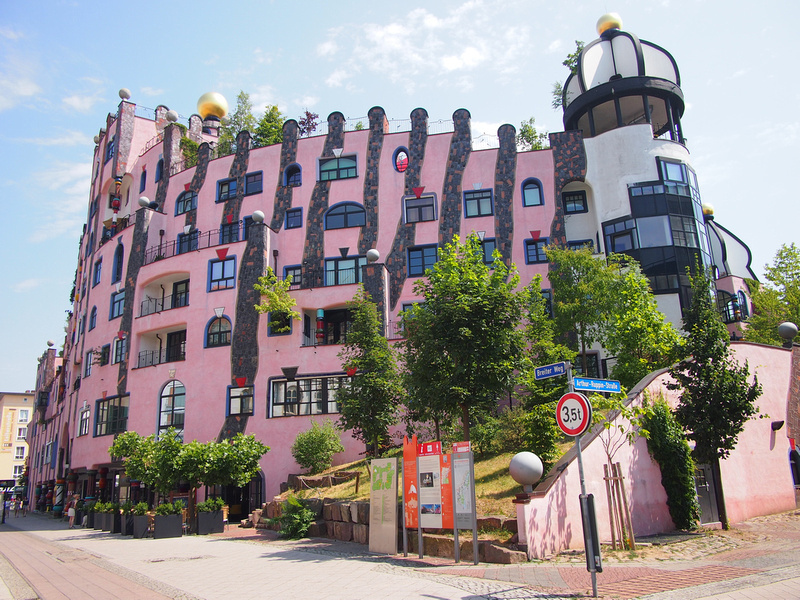 I’m a fan of the Austrian artist and architect Hundertwasser. Whenever I find myself in Austria or Germany (where most of his work is) I make a diversion to visit one. The Citadel has a mix of apartments and office space, with cafes and shops on the street level. Yes, people get to live in this wonderful building. The Citadel stands out amidst the drab communist-era buildings that you pass on the walk from the train station. 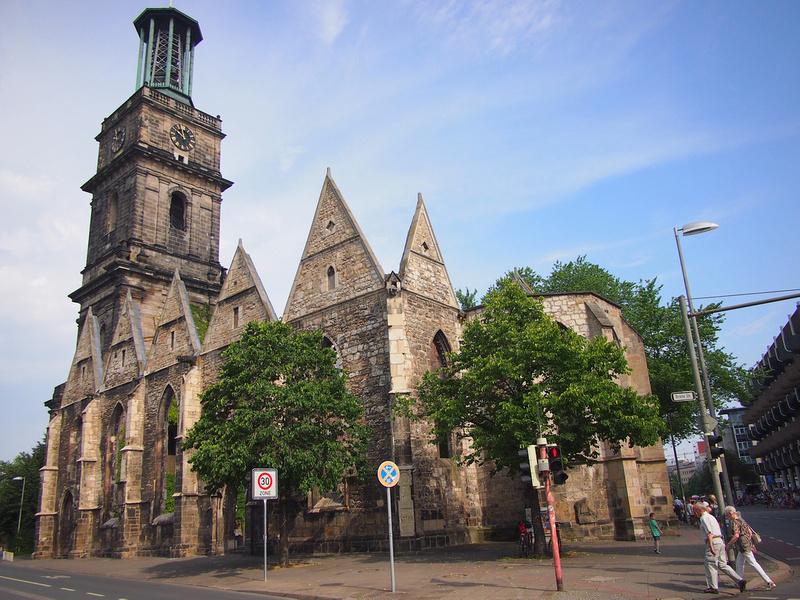 Visiting places like Magdeburg is where a Eurail Pass comes into its own. I would never fly to whatever airport is nearby just to see this, but seeing I am in the area this was an easy way to see something I wanted to see. When planning a Eurail make a list of obscure places that you would like to visit, then start threading a line between those destinations. 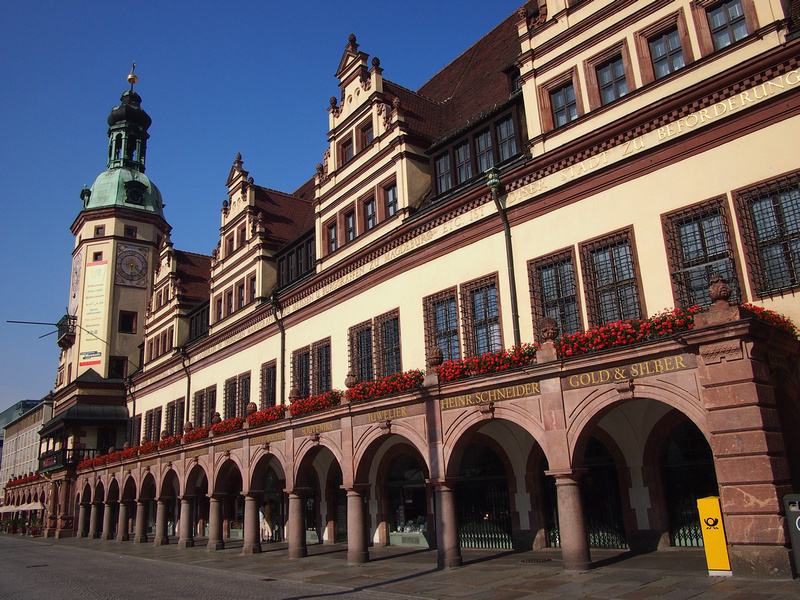 Leipzig has been described for a few years now as “the new Berlin”. Apparently artists and hipsters that have been priced out of Berlin have moved here and made a scene for themselves. With that description I had to see for myself. I got a sense that Leipzig is a bit of a hipsterville when I checked into the Ost-Apotheke Hostel, which is one of more cool and unusual hostels I’ve stayed at. Leipzig has a mix of old architecture and communist-era concrete blocks, and I see its appeal as a place to live. I selected Szczecin as my next stop mainly because it was on the way to my next destination. My aim was to average 4-5 hours a day on the train, which would give me half a day to explore everywhere I stayed. Szczecin was one of the first of many Polish cities I didn’t know anything about, let alone how to pronounce. Going somewhere without any expectations is such a freeing way to travel. I found so many lovely little surprises here that made it worth the stop. I stayed at the City Hostel, which was more like a guesthouse with private rooms. It was a good place to stay, though a fair distance from the train station. Gdansk is gorgeous. This city has been on my visit list for a while so it was an ideal candidate for this secondary city tour. 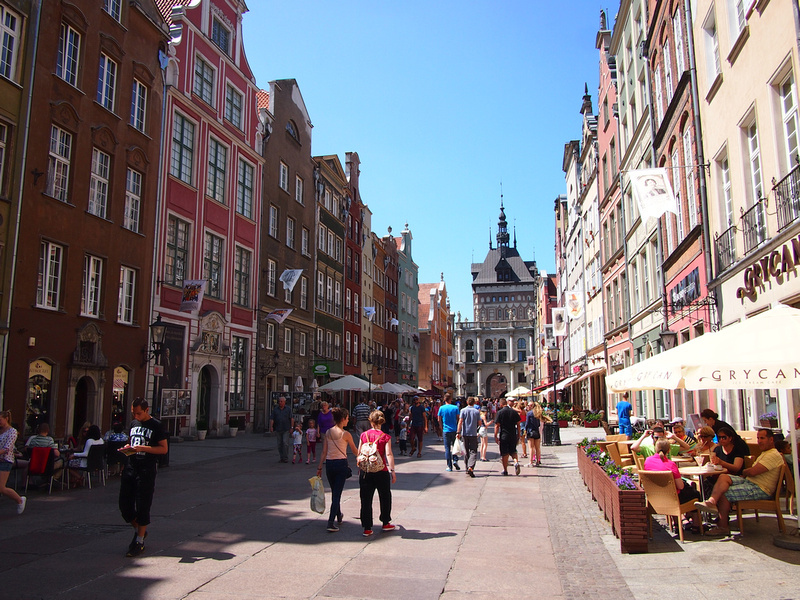 Gdansk is on the Baltic Sea and was a member of the Hanseatic League. The city still has many buildings from that glorious era. I stayed at the 3City Hostel, which is near the main station and has capsule beds; a trend that is gaining popularity across Europe. I hadn’t heard of Torun until I was in Poland and studying the map for possible routes to Poznan. Upon further investigation I found out that Torun has a preserved medieval old city that has been designated a UNESCO World Heritage Site. 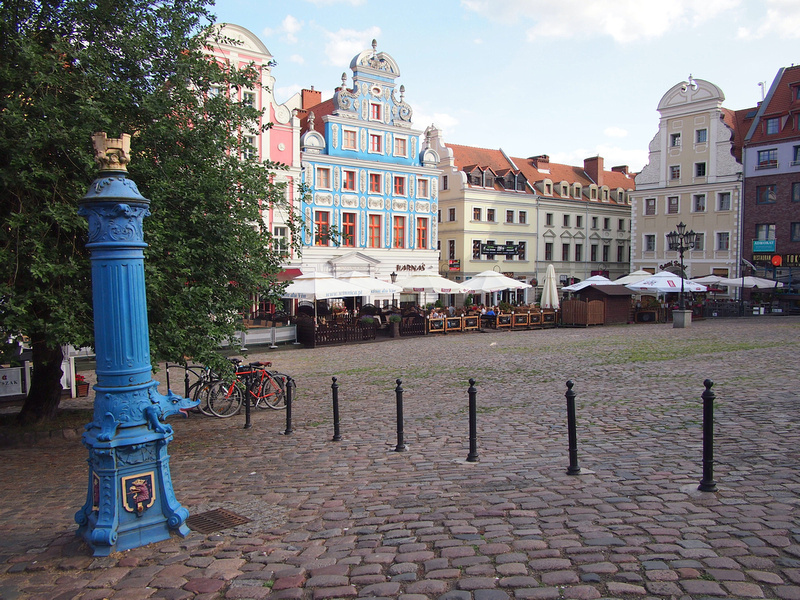 Torun is also the birthplace of astronomer Nicolaus Copernicus, of which the city is rightly proud of. I was glad I took the time to stop here. I stayed at the Poco Loco Hostel, which is located between the train station and the old city. 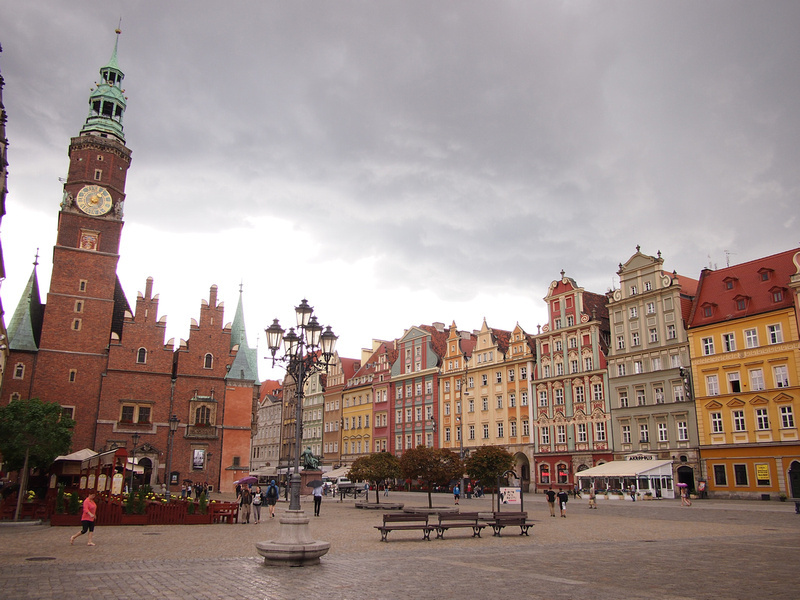 Wroclaw (which is pronounced nothing like it looks to English speakers) was my last stop in Poland. When I arrived in the old city I had come to the conclusion that Poland is one of the most underrated countries in Europe. Most people (including myself) tend to visit Warsaw and Krakow – which are worthy destinations in themselves – without considering the other cities. If you are in Poland give yourself more time to visit some other cities. I stayed at the Hostel Wratislavia, which is conveniently located nearer to the train station. I went through Brno a few years ago on another train trip I was on. I remember looking out the window and being stunned at this city with a magnificent cathedral on a hilltop overlooking the old city. I made a mental note that one day I should return here. 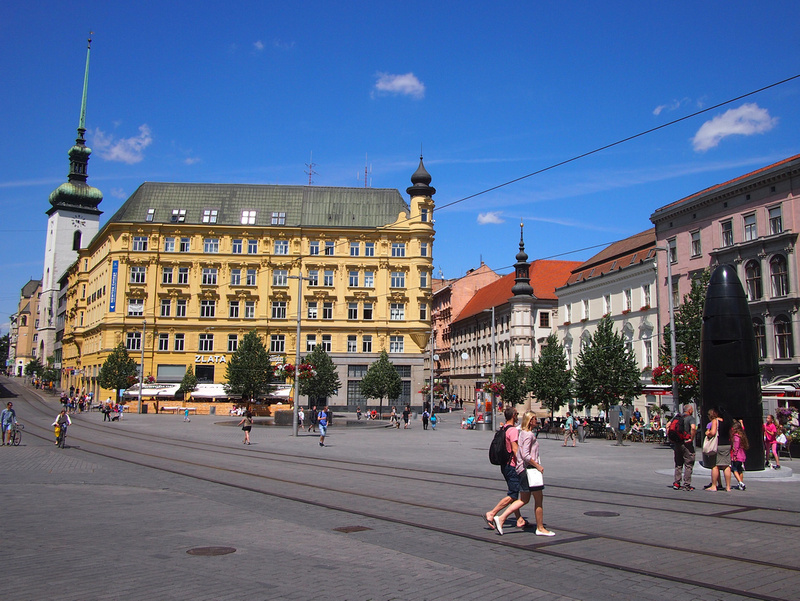 Brno is the second largest city in the Czech Republic. If you’ve never been to Prague then you should of course go to Prague. I have been a few times before so I was happy to explore another city without the crazy summer crowds that Prague is legendary for. I stayed at the John Galt hostel which I picked for its proximity to the station. 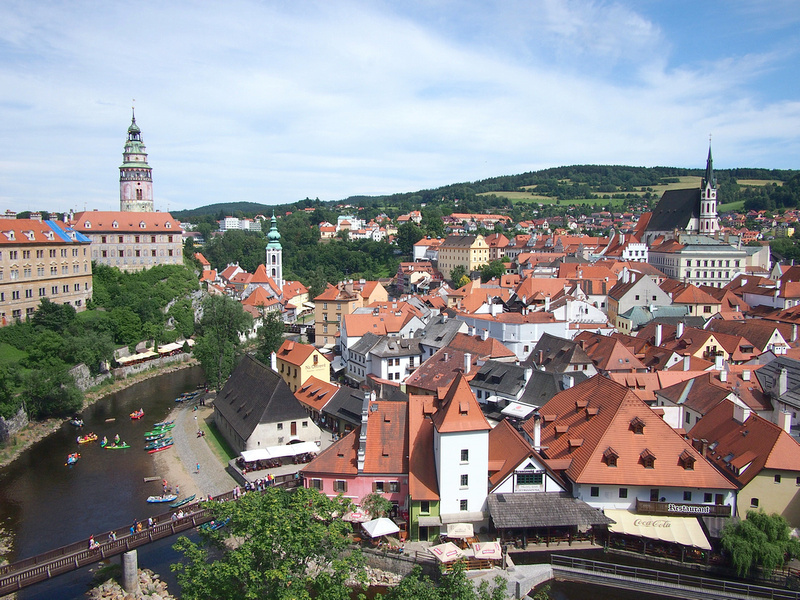 Cesky Krumlov is the epitome of fairy tale towns in Europe. This is one of the places I had been to before but I felt I needed to give it another chance. I was there ten years ago, in August 2005. I remember liking it but not thinking it lived up to its hype. Maybe I was in a better frame of mind this time because I loved it this time around. This place is so charming that I didn’t mind the summer crowds. Cesky Krumlov is accessed by a branch line from Ceske Budejovice. I opted to stay in Ceske Budejovice to allow for a quicker departure in the morning. For my American friends who drink beer, Ceske Budejovice is the home of the real Budweiser. It also has a picturesque town square. 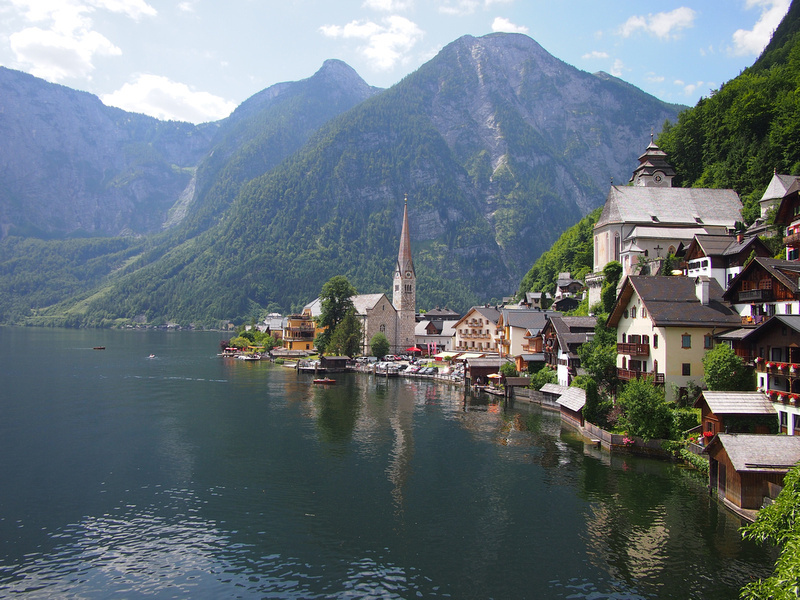 Hallstatt is exactly the sort of place you should visit when you have a Eurail pass. It’s an ideal day trip and a couple of hours here will do. There is no need to stay here unless you are travelling around Europe spending your children’s inheritance. 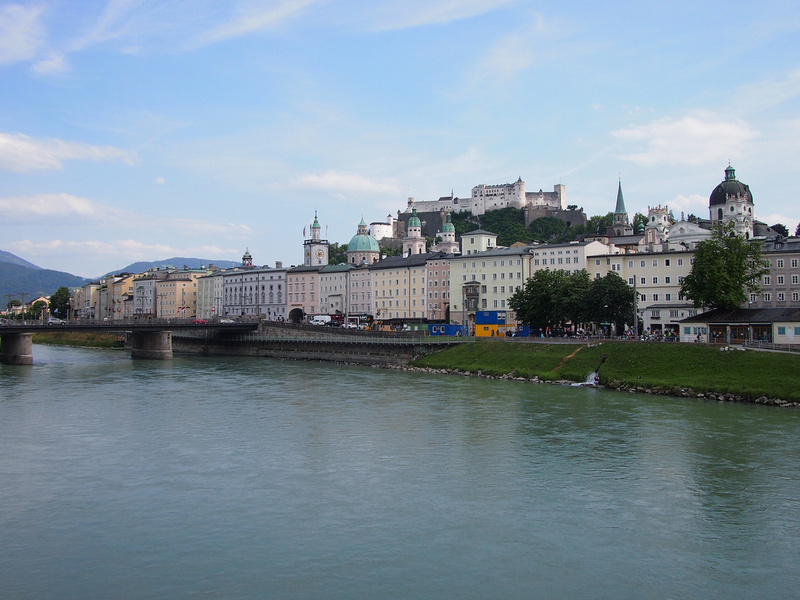 Salzburg is “castles and chocolate-box Europe” at its most intense. It’s the birthplace of Mozart and the setting of The Sound of Music, and you will be reminded of those facts everywhere you go in the old city. Despite this cheesy tourist aspect you can’t deny it is a beautiful city, and I was happy to return for another visit. I stayed at the Meininger Hotel Salzburg City Center, which is an independent hostel chain which I have stayed before, and they are a reliable and well-run operation. 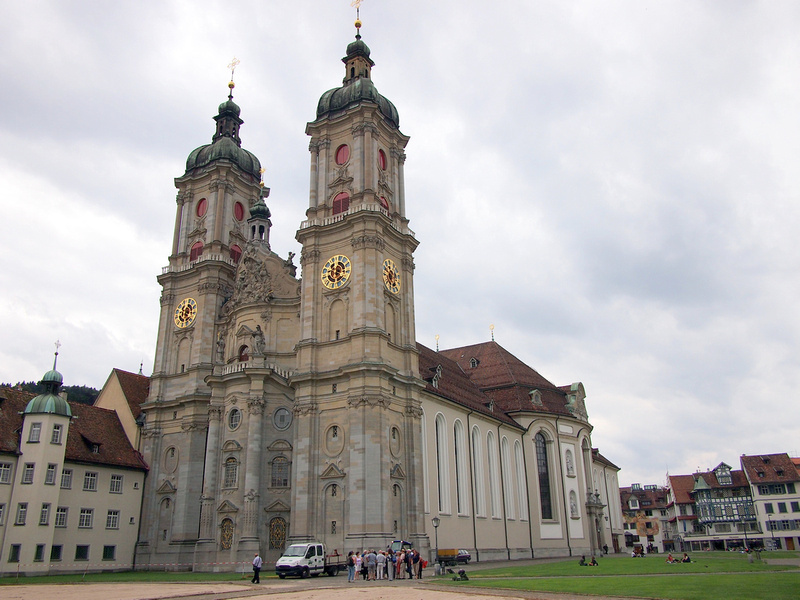 The first time I heard of St. Gallen was when one of my best friends met his now wife, who comes from St. Gallen. I have visited them here a few times over the last decade, and by chance they happened to be back while I was on this trip, so I made the detour to meet them. 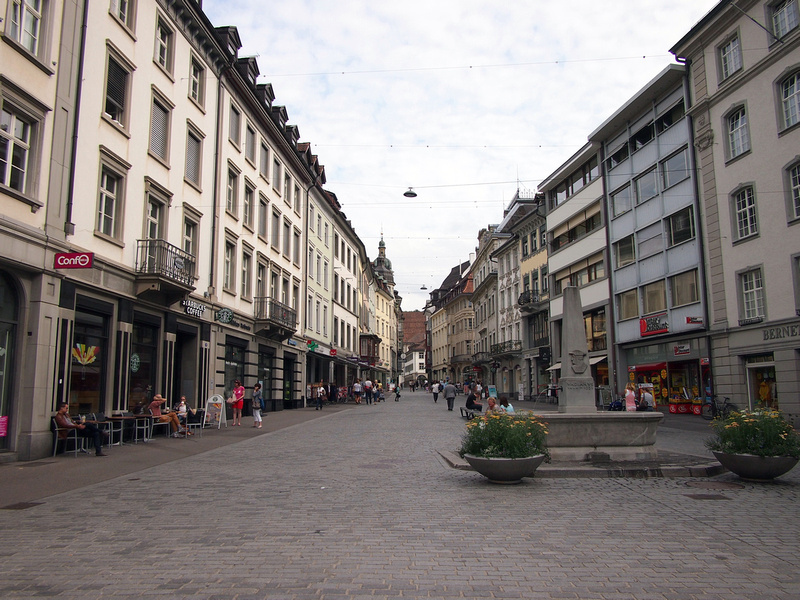 This is one of those cities that I can’t believe isn’t as well known as some of the other cities of Switzerland. Maybe that is a good thing though, so you too can visit these great cities that don’t get as many visitors as they should. St. Gallen is home of the St. Galler Bratwurst, which is a sausage I find myself dreaming about when I dream about European sausages (I can’t believe I just said I dream about European sausages). 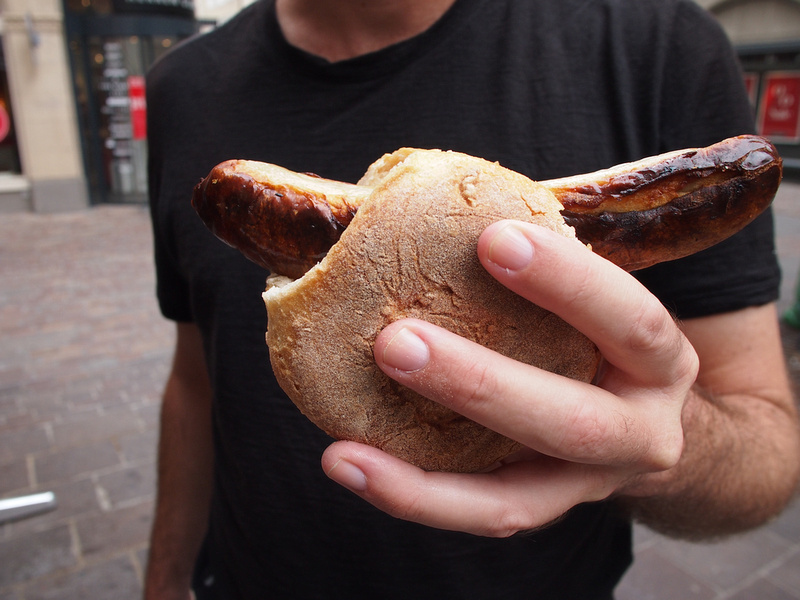 This sausage is always my first meal back when I visit St. Gallen. I stayed at an Airbnb apartment which I split with my friend. This turned out to be cheaper than staying in a dorm at one of the hostels. Today was a ridiculous travel day in what was already a ridiculous travel month; I travelled to four countries in one day. The day involved circumnavigating Lake Constance by train. Lake Constance is central Europe’s third largest lake and it shares a border with Germany, Switzerland and Austria. Liechtenstein is not far from here on the Austrian side, making up the four countries we visited. To pull this off we had to study the timetables the night before to make sure we got the best trains and made the most of our time. Our humble goal was to have a coffee in each country. Leaving St Gallen early in the morning we made our way to our first stop in Bregenz, Austria on the eastern shores of Lake Constance. The Eurail Global Pass advertises that you can travel to 28 countries, but they don’t include Liechtenstein as one of the countries. Even though Liechtenstein doesn’t have its own railway you can still travel to Liechtenstein on a Eurail Pass. Trains operated by the Austrian railways pass through here on the way to Switzerland. There are not many trains that stop at the main station of Schaan-Vaduz, so you need to plan your day so you don’t get stranded here. 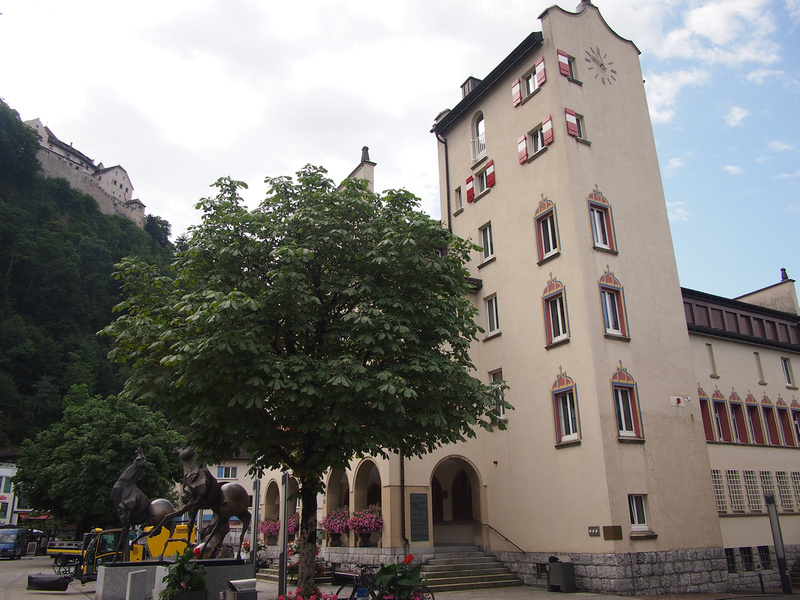 With a population of just over 5000 people, the capital city of Vaduz is more like a town than a city. From Vaduz we got a train to Lindau in Germany. Lindau is a medieval city set on an island in Lake Constance. The train station is on the island and from there you are right in the old town. It’s a popular holiday spot in the German-speaking lands of Europe, and probably just as well it isn’t as well known elsewhere, otherwise it would be overrun. Not far from Lindau is Friedrichshafen. This city is famous for being the home of Ferdinand von Zeppelin and his dirigible factory. 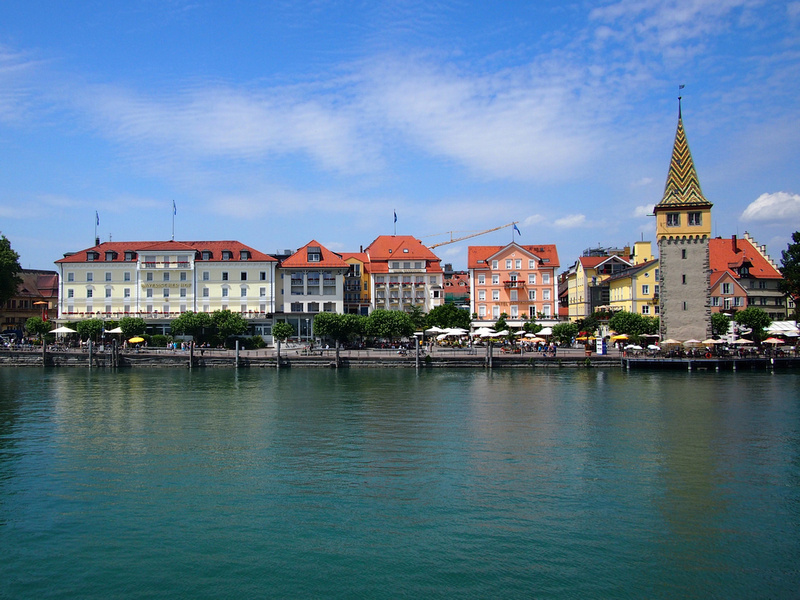 As an industrial city it was a prime target for bombing in WWII, so the rebuilt city is stark contrast to the olde world feel of Lindau. I enjoy visiting these rebuilt cities because where they lack in architectural beauty they sometimes make up for in interesting public art. 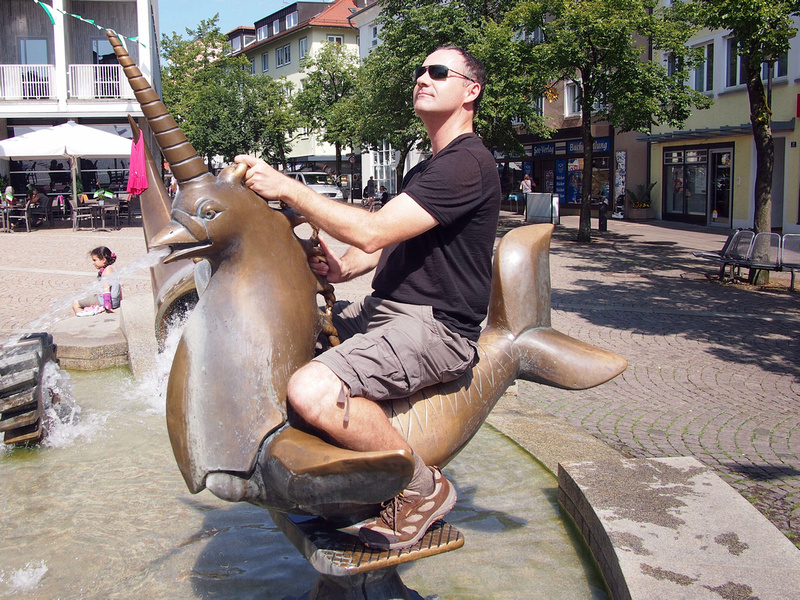 In the case of Friedrichshafen we found this unusual water fountain that included a rideable unicorn chicken. 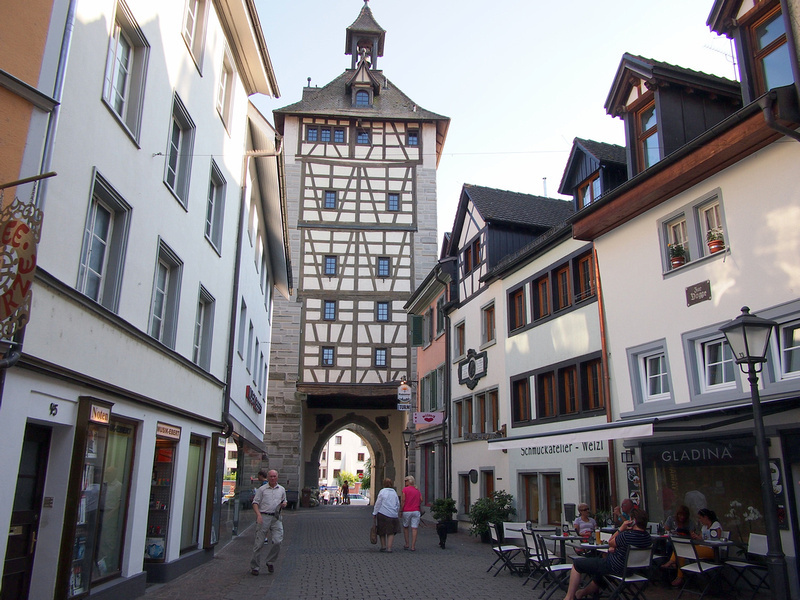 Our next stop was Radolfzell, which wasn’t in our original plan. We were making our way around the lake and we had to change trains here. Rather than wait for 45 minutes at the station we walked around the old town before making our way to our next stop. Konstanz sits between two lakes connected by the Rhine River. It has the amenities of a big city with a vibe of a waterfront holiday destination. 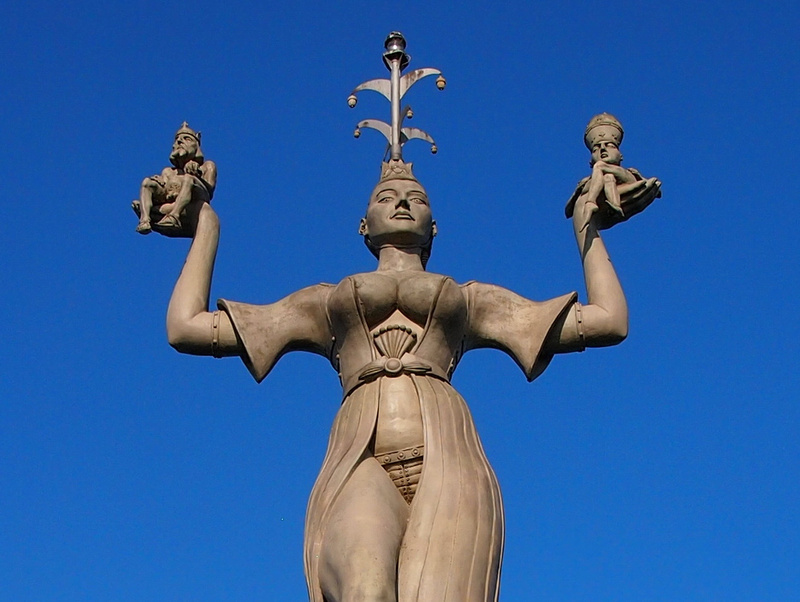 Konstanz is home to one of my favourite statues in Europe; Imperia. This statue is on a pier in the harbour and rotates every four minutes. 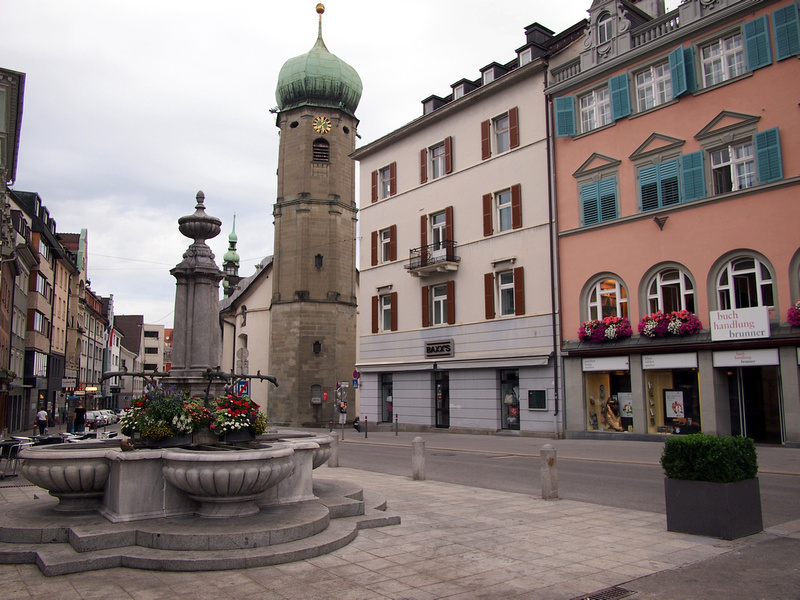 The city of Konstanz is on the border of Switzerland. Here you can walk to a land border crossing with Switzerland, and then get a regional train to other points in Switzerland. This is where we made our way back to our home base in St. Gallen. It was a long day but it never felt rushed. We had planned out our day beforehand, making sure we had enough time to walk around each destination at leisure, with time to have a coffee in each country. Zurich was one of the few primary city stops on this trip. The Travel Gods had fated that two of my best friends happened to be in St Gallen and Zurich within a day of each other. After leaving my American friend in St Gallen I met my Australian friend in Zurich. 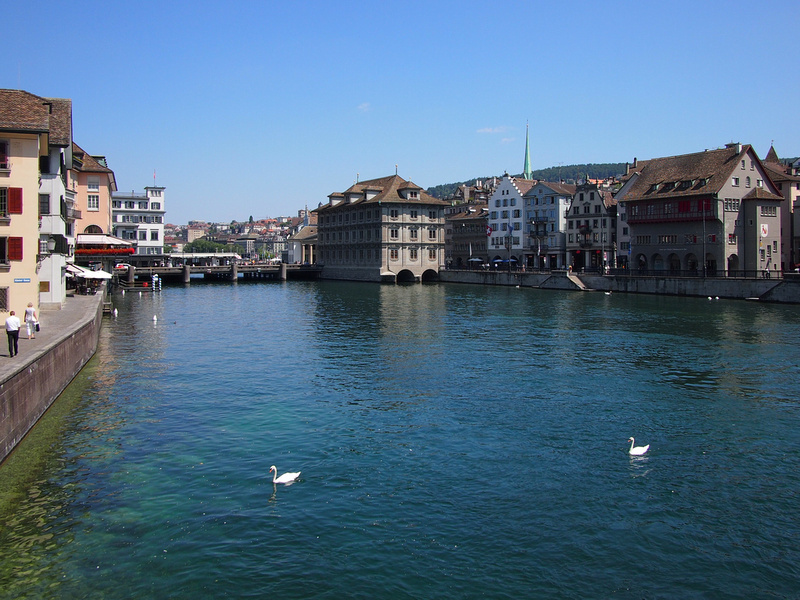 I lived in Luzern for six months in 2003 which is also near Zurich, so I’ve been through Zurich many times. It’s famous for being a staid banking city, but in the last decade it has loosened up and I am always happy to return to this pretty city. I stayed at the Zurich Youth Hostel which is a very well run YHA hostel, though it is in suburban Zurich. Luckily its near enough to a regional train so I could use my pass to get there. If you are on the rails around Europe with Eurail the chances are good that you are going to pass through Milan at some point. 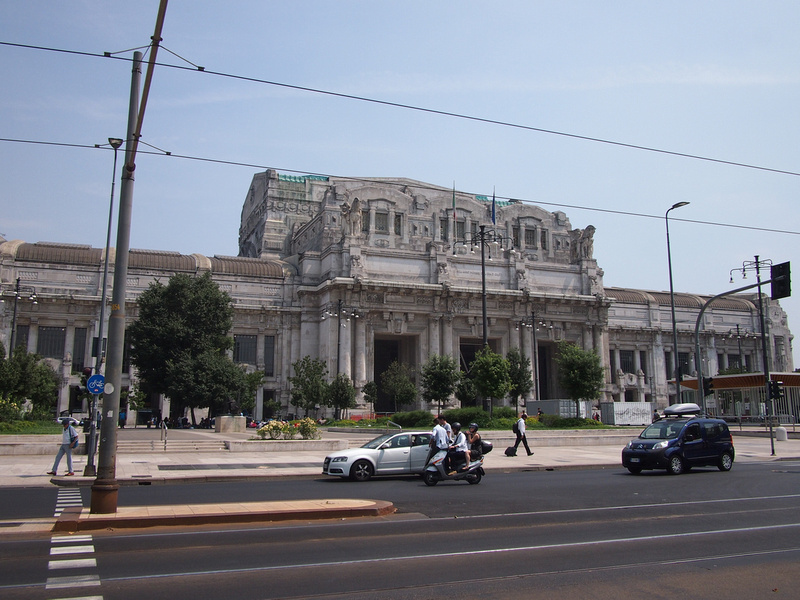 I arrived in Milan at Porta Garibaldi railway station and had to get my next train at Milano Centrale railway station. Google maps said it was a 25 minute walk, but I got lost and it took longer. I have been to Milan so I just made Milan my lunch break. If you haven’t been you should make time to see the Duomo and Galleria Vittorio Emanuele II. Turin is famous for The Shroud and for Juventus F.C. There is more to the city than Jesus and football, and this is one grand city that should be getting way more visitors than it does. This is a problem for many of the secondary cities of Italy, who have to fight for the patronage of tourists from the heavyweights of European tourism of Venice, Florence, and Rome. Being back in Italy my gelato addiction was reawakened. Having just one gelato a day is a real exercise in self-will, of which I don’t much of when it comes to ice cream. Turin is a big city so I picked a hostel that was close to the train station. I was able to drop my bags quickly which helped because I arrived later than I planned. Being near the station was useful for the early morning departure. 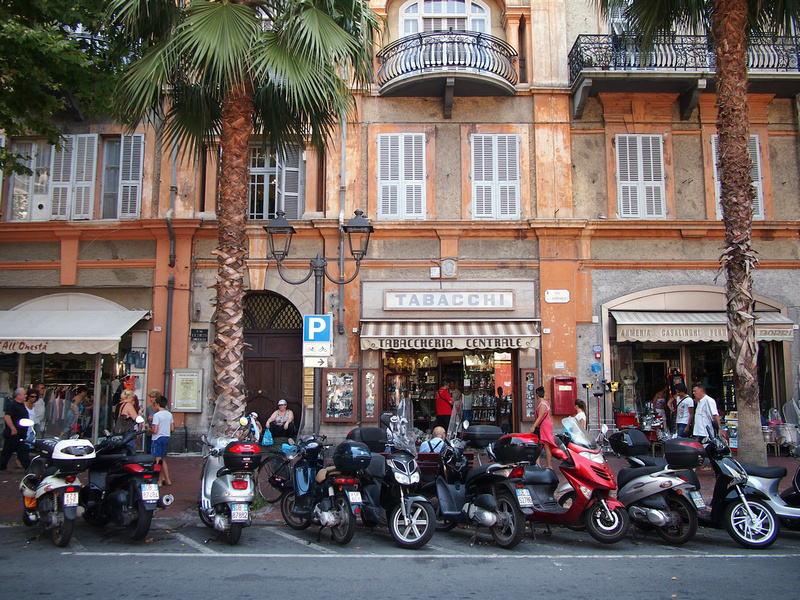 Ventimiglia is near the border of France and I had to change trains here. This was another place I didn’t know anything about and it was a pleasant enough place to wander around for an hour between trains. 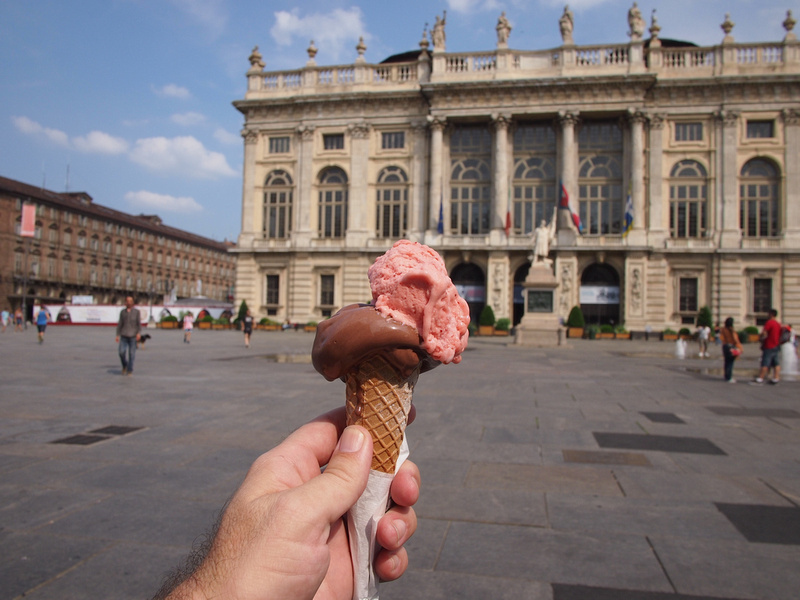 I love the streetscapes of Italian cities so I soaked up the atmosphere with one more gelato before crossing into France. 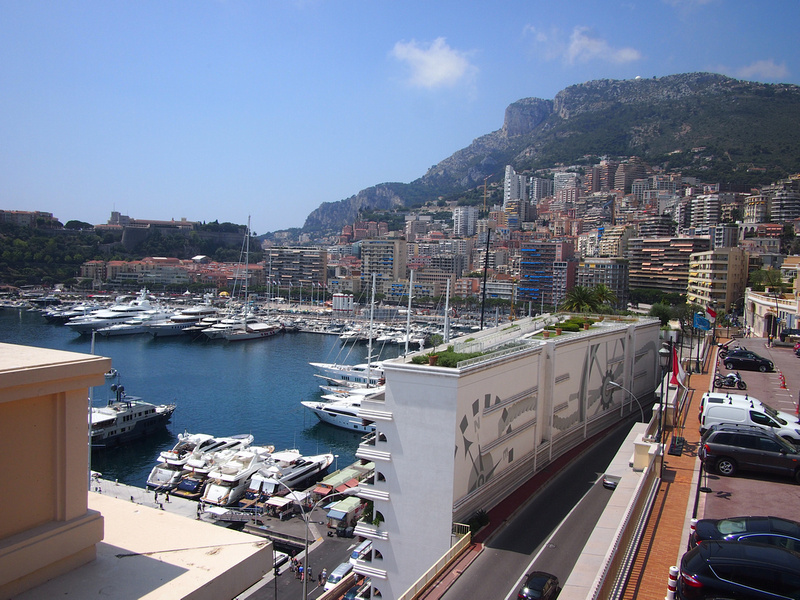 The second “bonus” country on Eurail is Monaco, which is served by the French railway SNCF and thus not counted as a country. Monaco is a real country though, and it has a real train station, so if you are passing through the south of France you should make a stop here and claim a new country. 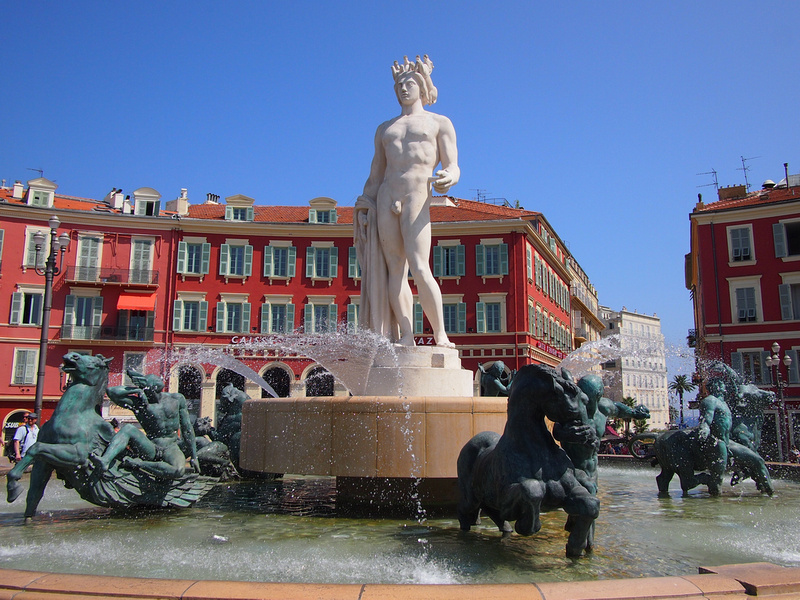 Nice is a city I’ve been through before and it makes for a good base if you are exploring Provence-Alpes-Côte d’Azur (the region which includes Provence and the French Riviera). There are more budget accommodation options here than anywhere else on the coast so you’ll probably end up staying here even if you don’t want to. 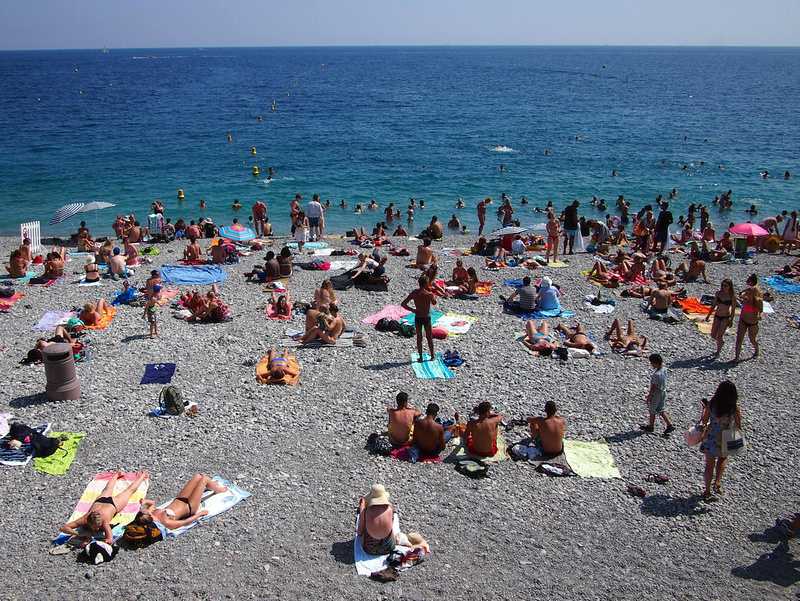 Some of the cheap hotels in Nice are pretty crappy, so look in advance for better places. Nice has a (sorry in advance) nice old town (Vieux Nice), which is just as well, because the famous beach is nothing but stones. Today was my longest travel day and not one I would normally recommend. 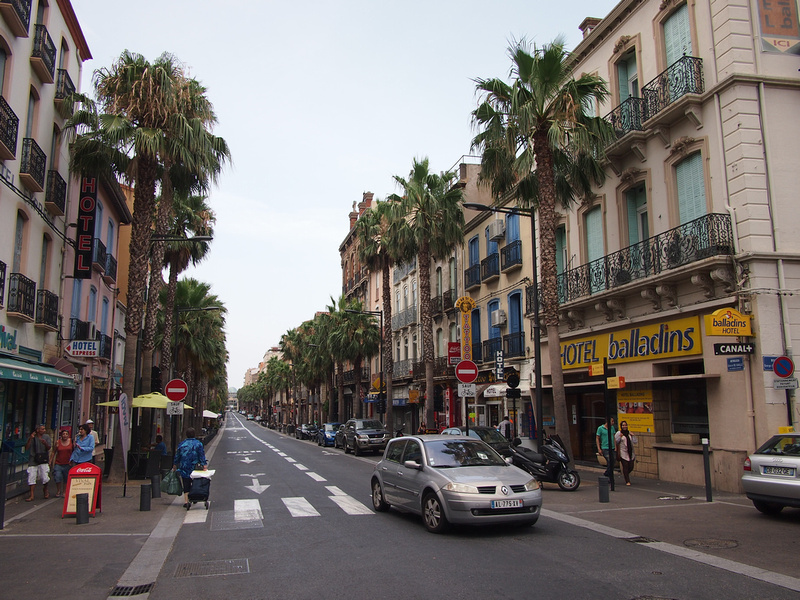 I had a date to keep in Spain which had me rushing across the bottom of France, otherwise I would have stayed somewhere along the way (like Avignon or Montpellier). I was also using regional trains to avoid the high-speed supplement which slowed my day down. Having said that it was still a reasonably easy travel day, and long days on the train are great when you travel with a book. My first stop for the day was in Marseille. I’ve stayed here before so I didn’t plan a long stop. I had enough time to walk down to the harbour and back, and get lunch. 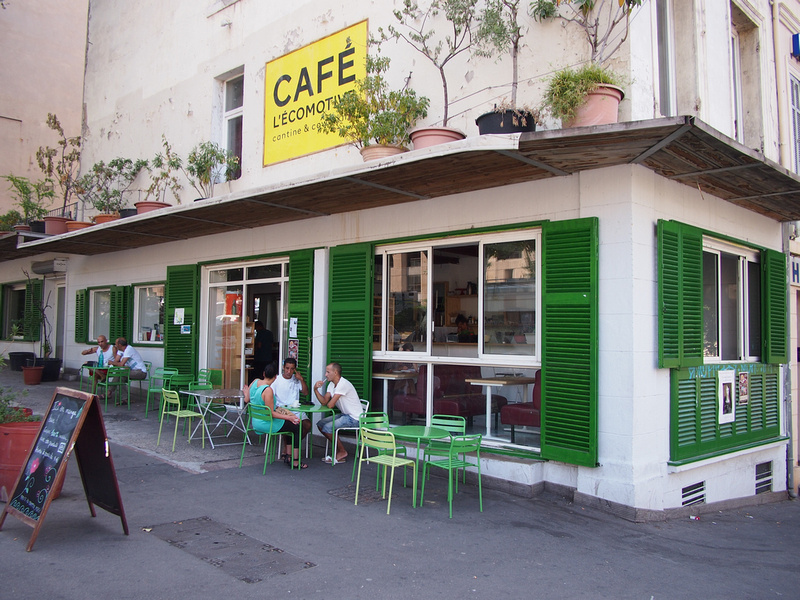 Marseille is famous for food so you should at least plan a meal here. Even if you’re only changing trains at Gare de Marseille-Saint-Charles, step outside the station for a few minutes because the view is incredible. 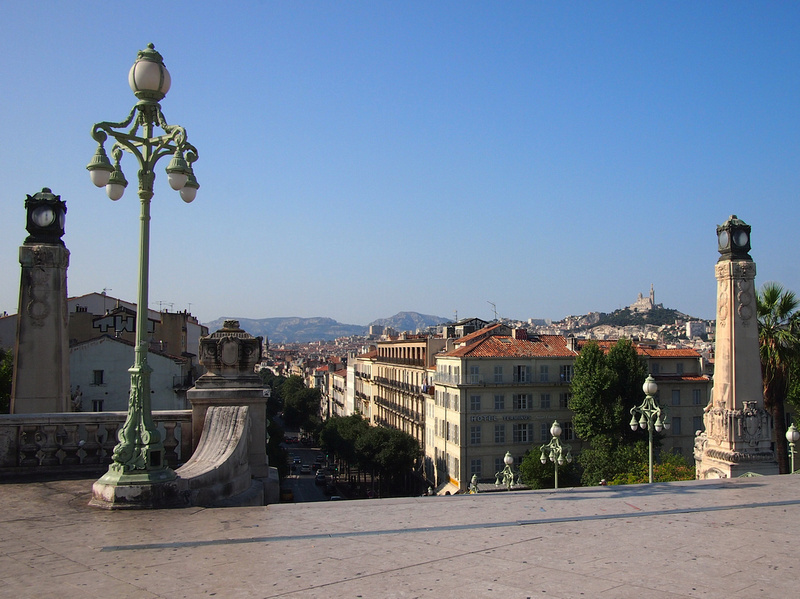 The station sits on top of a hill that overlooks the port, with the Basilique Notre-Dame de la Garde in the distance. At the bottom of the station stairs there is a cool independent cafe which makes for a nice break from the station cafes. I scheduled an hour here to have a little walk around the old town before getting on my next train. Before arriving I had a quick look at a map to work out which way to walk from the station. Somehow I got my directions wrong and walked out of the wrong side of the station. I thus spent most of my time walking around boring suburbia before realising the error of my way. By the time I got on the right side of the tracks it was almost time for me to go. When you travel by regional train across international borders the train usually terminates at the first station across the border. You then continue on a train service by the new country. 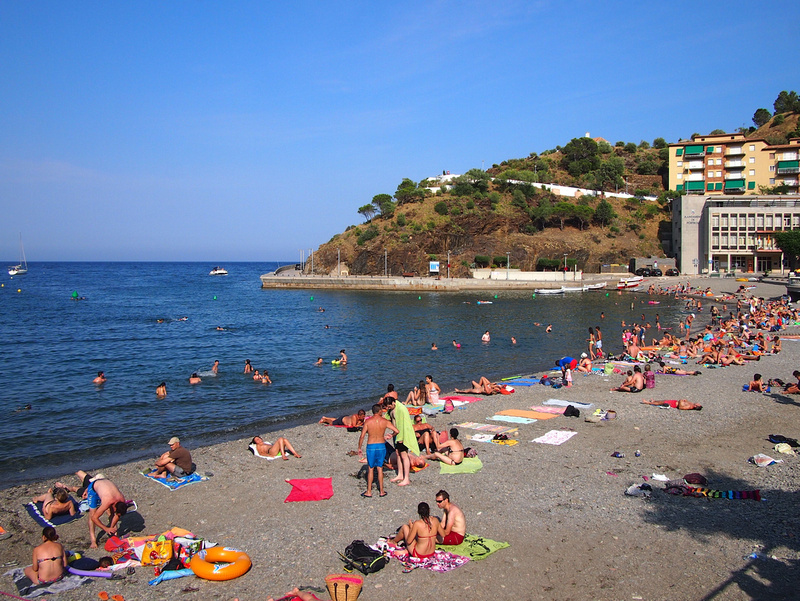 Crossing into Spain from France the train stopped at Portbou which looked like it’s a popular weekend beach for locals. 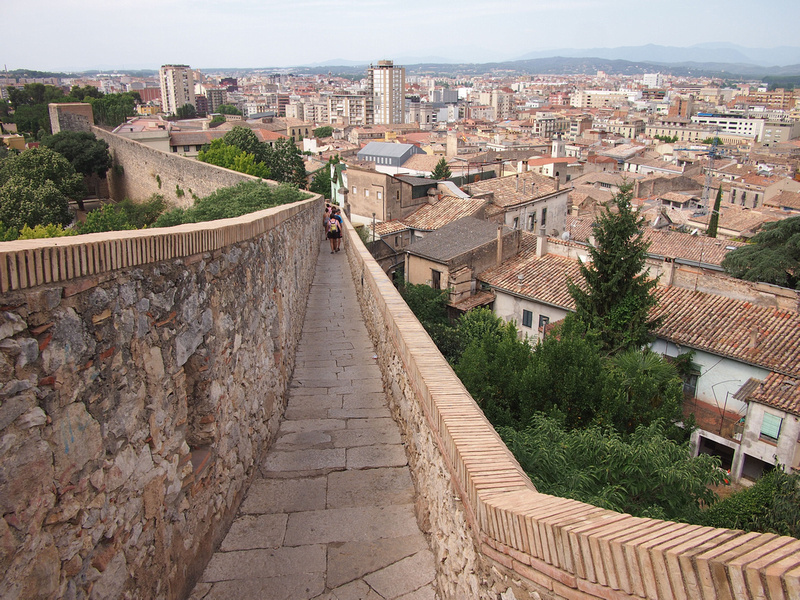 I arrived in Girona in the evening and checked into the Hotel Carlemany. One of the benefits of travelling in the summer is the late sunsets, so I was able to enjoy the old city before it got dark. Knowing that I was going to be on a train all day the previous day, I scheduled a day off from travel and caught up with some admin. 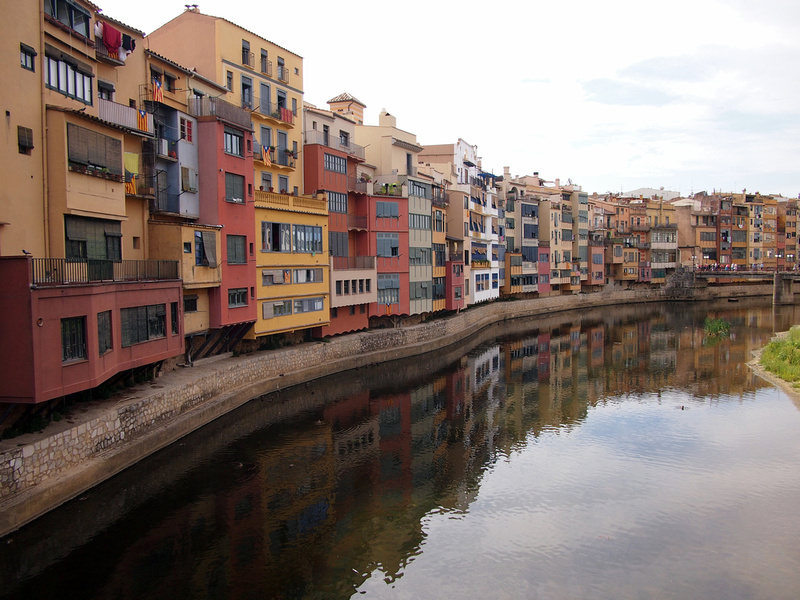 Girona is a classic secondary city of Europe. It is overshadowed by neighbouring Barcelona, which is one of the most visited cities in Europe. This trip so far has shown me that there are plenty of great cities in Europe, so if you find yourself complaining about summer crowds in the big cities then make an effort to go beyond the alpha cities. Barcelona was the first city I visited on continental Europe, back in the year 2000. I have since revisited and it remains on of my favourite cities in Europe. In keeping with my plan to visit new cities I didn’t include Barcelona in my itinerary. However if you are travelling from France to Spain on the Mediterranean side you have to pass through Barcelona anyway. If you’ve never been you need to stop and hangout here. I changed trains in Barcelona and in between trains I met up with my friend Dan, who recently moved to the city after years of living in Asia. He met me at the station and walked me to one of his favourite cafes. 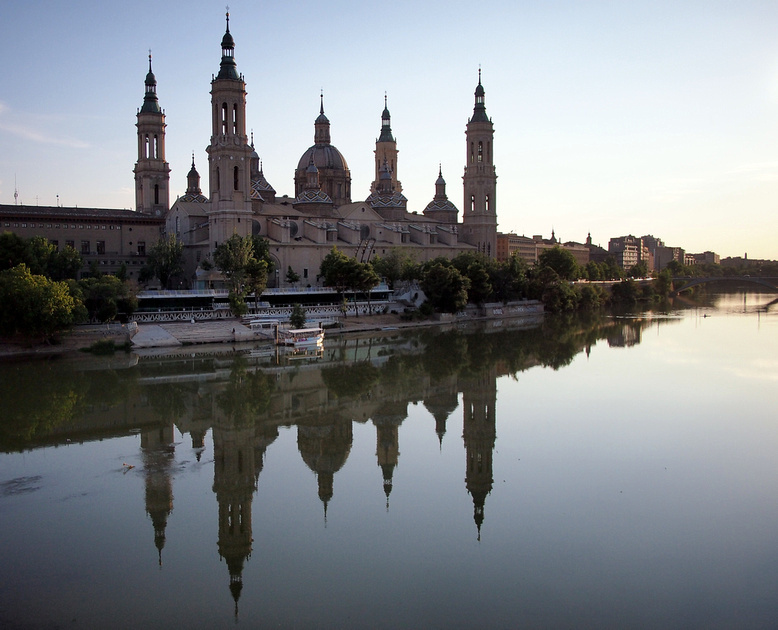 Zaragoza is typical of many cities in Spain; rich in cultural attractions and not on the mass-tourism radar. There are a collection of buildings here which form part of a UNESCO World Heritage Site. The most striking is the incredible Basilica of Our Lady of the Pillar, which is seen here on the Ebro River. I stayed at Be Hostel, which is a cool hostel located close to the action in the old city. A few years ago I had met a man from Bilbao on a tour in Bali. We kept in touch on Facebook and he invited me to stay at his place should I ever be in his home city. I’ve always wanted to visit Bilbao so this trip was a good excuse to go. 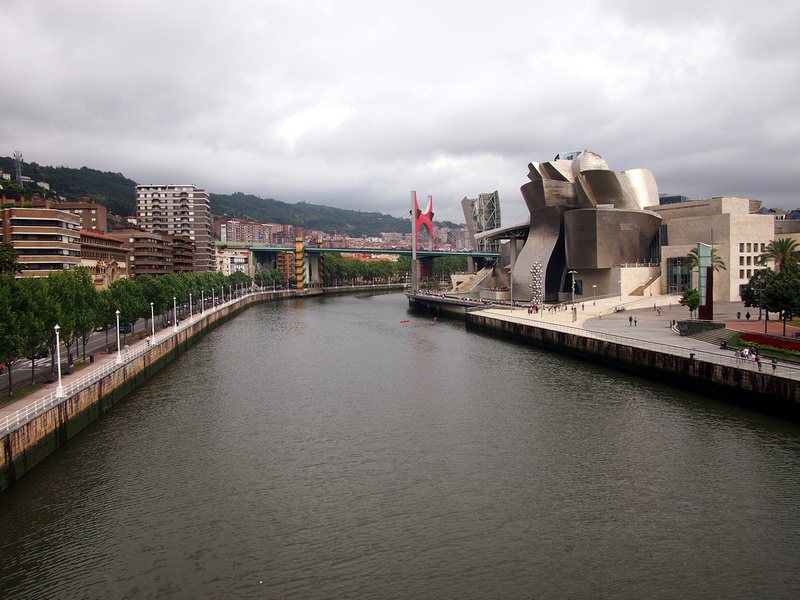 Bilbao is one of the trickier places to visit on Eurail, which I didn’t know until the day I went there. The Basque region has its own railway separate to the Spanish railway (Renfe) and is not included in Eurail. The only Renfe train into Bilbao requires Eurail Pass holders to pay a supplement. I had been travelling on trains without supplements so this was my first additional fee I had to pay. Bilbao is definitely worthy of a visit, but that is something to know just incase you are trying to travel without paying extra. Bilbao is a former industrial city that fell on hard times, then had a revival with the opening of the iconic Guggenheim Museum. Cities around the world now look to Bilbao as a template of revival by one building. These cities are looking for their own Guggenheim to lift their fortunes. Today was my second and last scheduled day off from Eurail travel. In hindsight I could have easily travelled every day of the month. If you want to make the most of your pass I would do this. I surprised myself with how effortless the daily travel. I was staying with my friend who lives in Getxo, which is the port city in the greater Bilbao area. 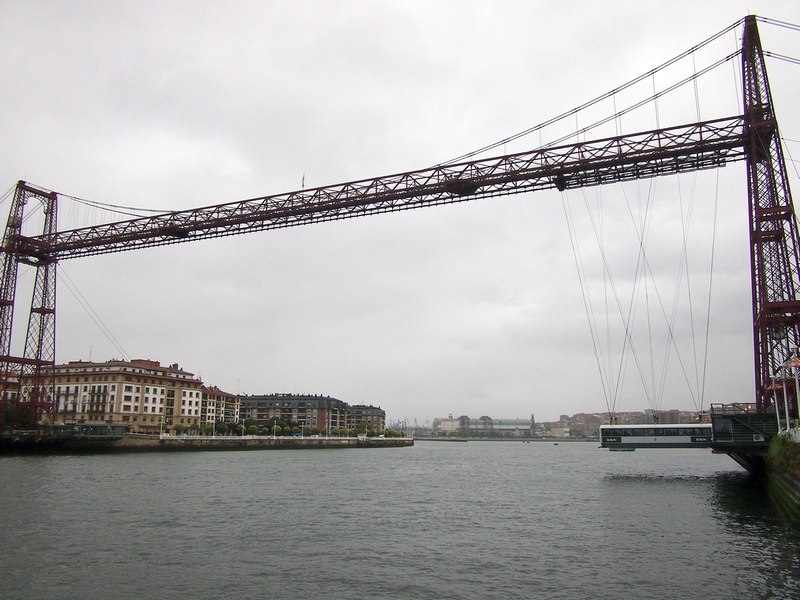 It’s in the Bilbao metro system and it’s worth visiting to see the Vizcaya Bridge, one of the few remaining transporter bridges in the world. In addition to Bilbao being limited in options to get to the rest of Spain, heading north to San Sebastian and onwards to France also proved problematic. My options were a backtrack out of Bilbao and then getting another train to San Sebastian, or getting the metro train that operates between Bilbao and San Sebastian, which isn’t included in Eurail. As far I have seen in my research, this is the only train system not included in Eurail (apart from mountain tourist trains). This cost €6.90 so I took this option to save a lost day of travel. You can get to San Sebiastian with a Eurail Pass, just not via Bilbao. 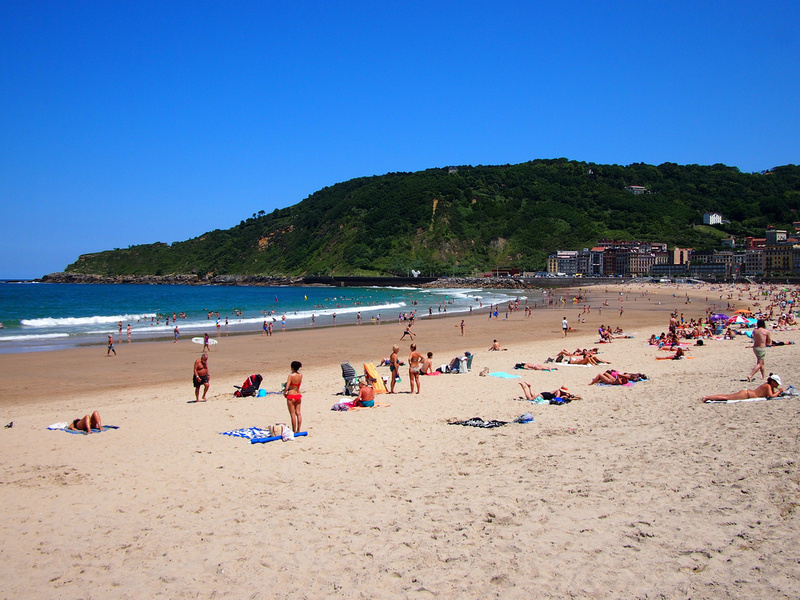 I’m glad I included it in my itinerary because San Sebastian is incredible. I arrived on a beautiful summers day and the beaches reminded me that summer was here is this part of Europe. It was weird to see surfers strolling the streets of a European city, but that is the sort of city San Sebastian is. 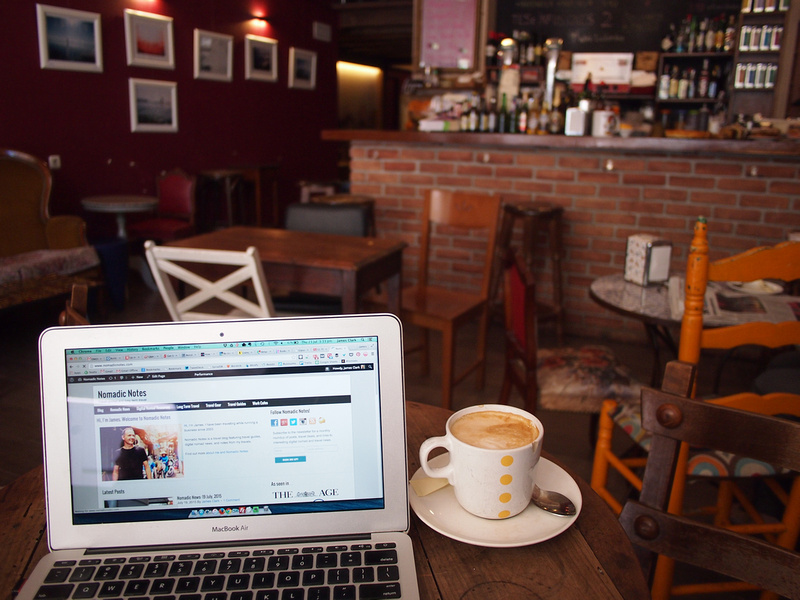 My surfboard is a laptop, which I always carry with me in case I find a cool cafe. In this case I stumbled upon Café-bar Koh Tao. It looked inviting, and the Thailand reference got me through the door. I stayed at Urban House, which is a hostel ideally located in the old city area. Today began my double challenge of finding a way to travel through France without paying a supplement, and avoiding going through Paris. Nothing against Paris of course as it’s freaking amazing, and one day in Paris is better than no days. For the purpose of this trip though I was visiting new cities. Paris has half a dozen train stations so connecting without staying would have been a pain. Eurail has an excellent timetable planner on the website and on apps (iOS|Android) which allows you to search for train without supplements. By doing this I found a route to La Rochelle via Bordeaux. I allowed a couple of hours in Bordeaux, which gave me time to explore the old city area and have lunch while admiring one of the many churches. I don’t drink, but if you do this would be the opportune time to have a Bordeaux in Bordeaux. 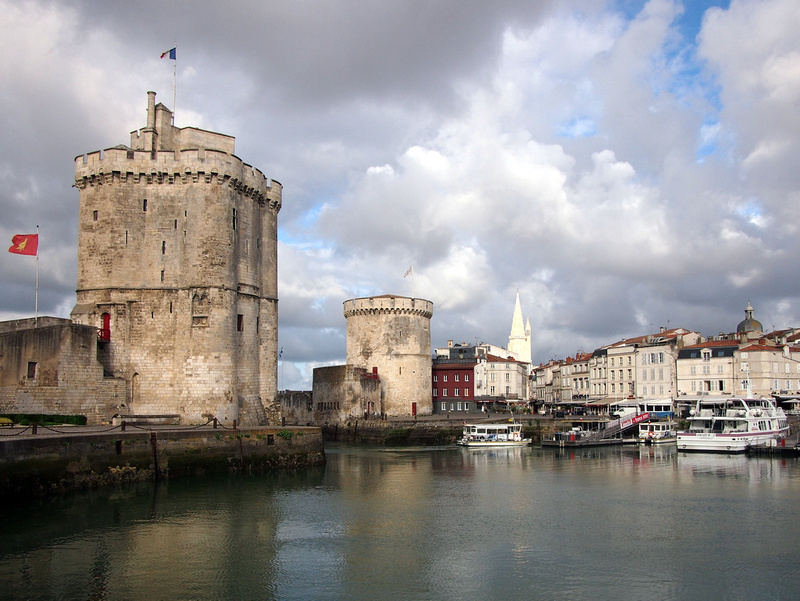 La Rochelle is a historic port city on the Atlantic coast. It has a well-preserved old town which is easily explored in an afternoon. I stayed at the Hotel Saint Nicolas which is located next to the historic area and was easily accessible from the station. Continuing my journey of avoiding high-speed trains, my next stop was in Nantes. Rather than get the next available train I got off here to have a look around. 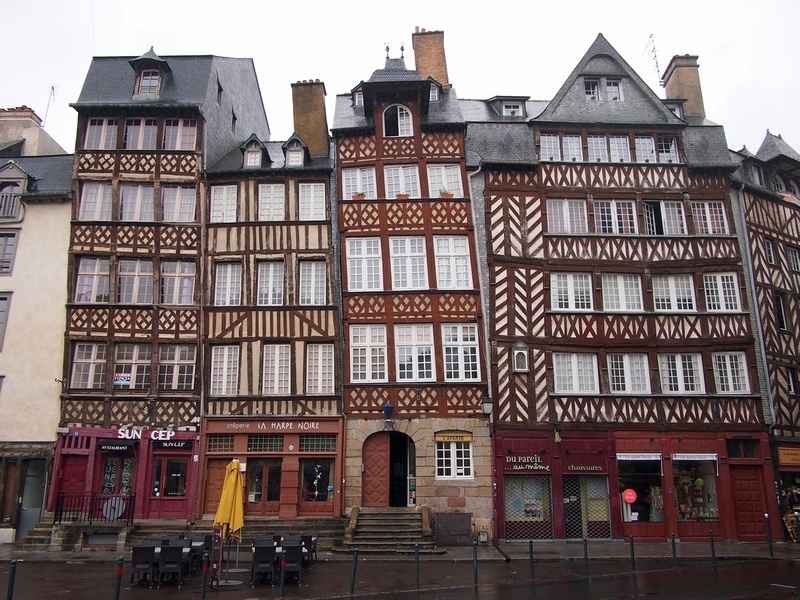 I stayed in Rennes because it had the best transport and accommodation options in the area. The main train station is modern and rather ugly, which didn’t bode well for my choice of city to stay in. Fortunately as you walk into the city things improve and there is a good old city area. I stayed at the Auberge de Jeunesse, a HI Hostel which kept up with the usual high standards of HI Hostels. You know that saying about the best-laid plans, well today was a day that didn’t go to plan. Even with a well-planned trip you should allow for a few days where things don’t work out. One day out of 31 wasn’t bad in the end. Today I had planned to Visit St Malo and Mont Saint-Michel. The day of my visit the track that serves the station close to Mont Saint-Michel was closed for maintenance. There was a replacement bus but it turned out to be a terrible day and I didn’t want to get the bus there only to find the castle shrouded in mist. With a full schedule and the track still out of action I wasn’t going to make it to Mont Saint-Michel on another day, so I will save that for another trip. 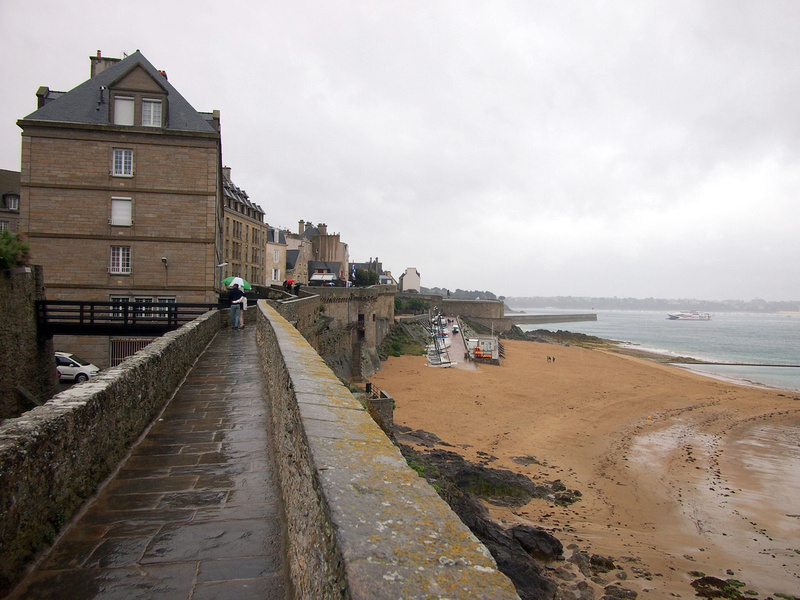 I did go to St Malo and spent a miserable few hours there huddled under doorways while dashing out into the cobbled streets in between showers. I would like to revisit when I go to Mont Saint-Michel. I made my way back to Rennes, where I had based myself for two nights. I enjoyed the wonky buildings in the old town. Le Mans was my next stop in my avoiding the high-speed train odyssey across France. My trusty app told me I could spend an hour here before making my next connection. Le Mans is famous for the 24 Hours of Le Mans. 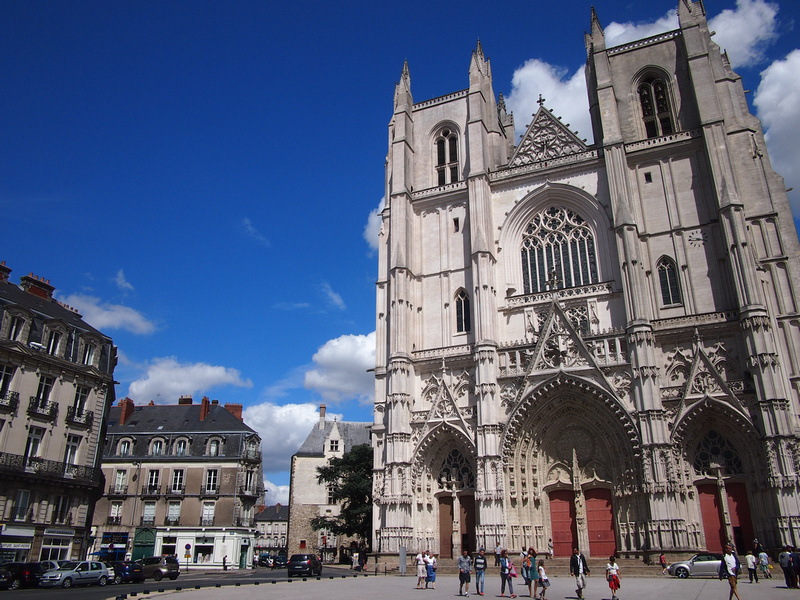 It also has an amazing cathedral, as does most cities in France it seems. The cathedral is a bit of a hike from the station so I mapped out a route before I arrived so I could walk to the cathedral and back with enough time to spare. 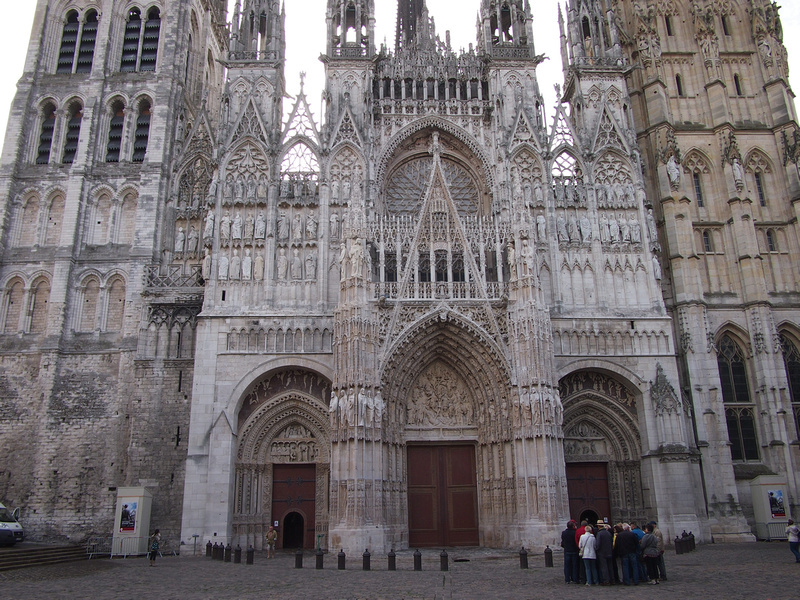 Rouen is home to one of the grandest cathedrals in France. It’s worth visiting Rouen for that alone. 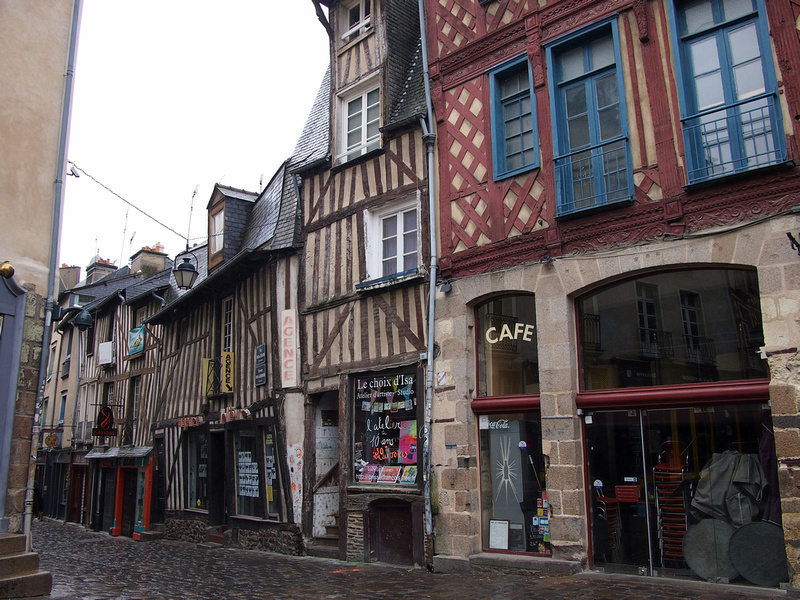 Rouen is where Joan of Arc met her fate on a burning stake. 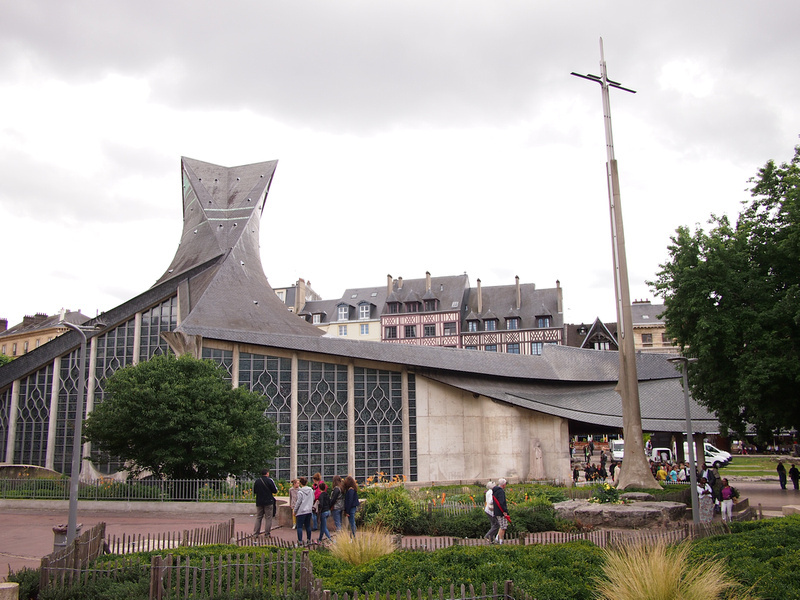 The Church of Saint Joan of Arc was built in the 1970’s next to where she died. I don’t think they employed the same architect that built the cathedral. 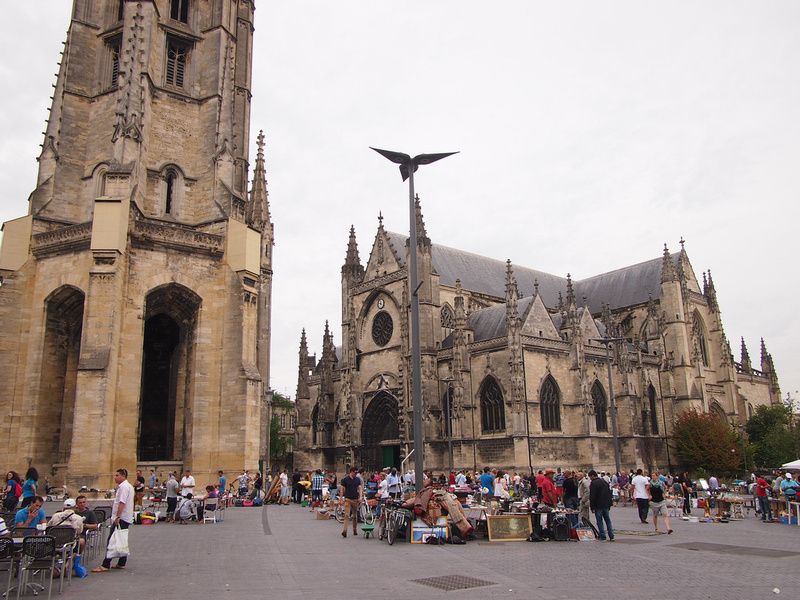 I stayed at the Hôtel Rouen Cathédrale which – as the name would suggest – is not far from the famous cathedral. 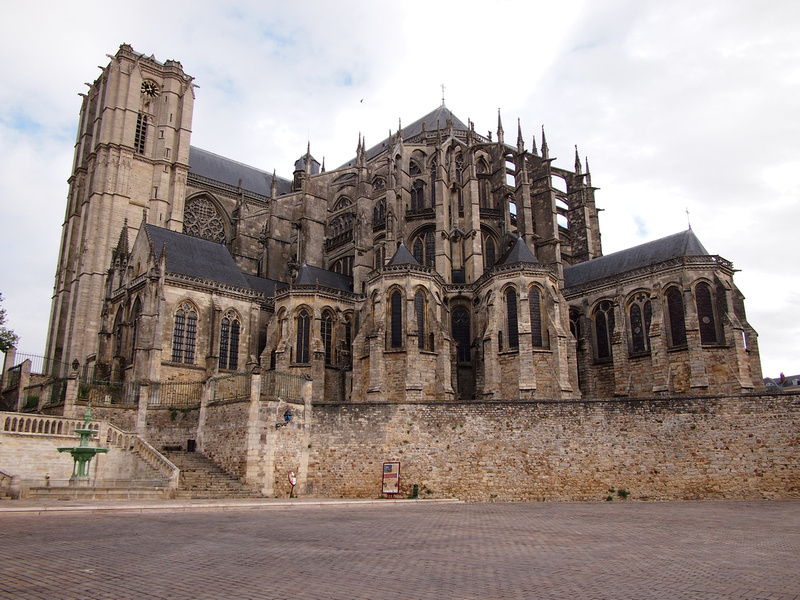 I know I’ve already said that Mons and Rouen have amazing cathedrals, but you really have to see the cathedral in Amiens because its amazing! Amiens is a useful junction for getting trains towards Belgium. 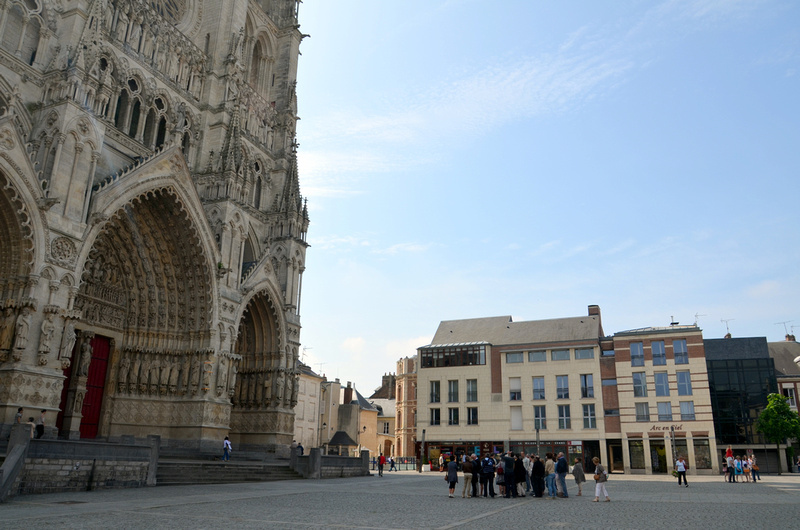 Stop here for an hour so you can go and admire the Cathedral Basilica of Our Lady of Amiens. I arrived in Mons in the midst of European Capital of Culture celebrations. 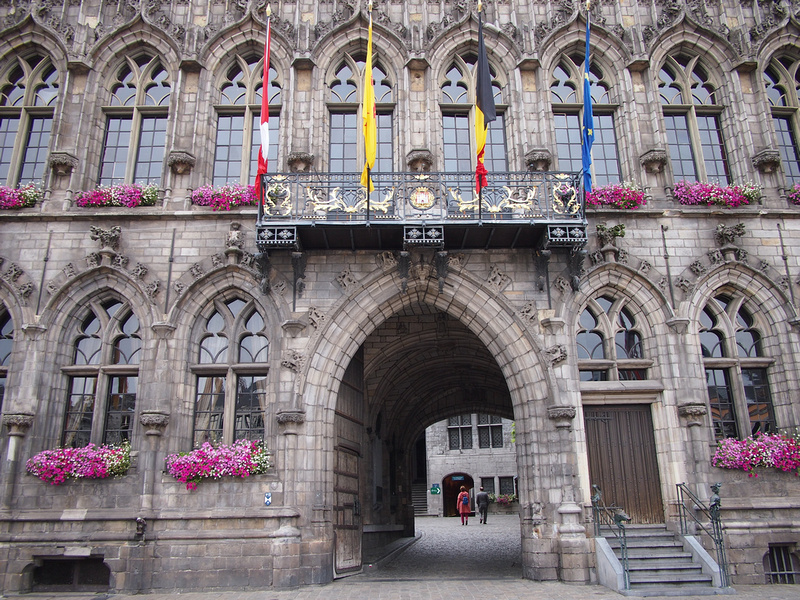 It seemed appropriate that I visit Mons on this secondary city tour, as European Capitals of Culture are usually awarded to lesser visited cities in order to promote tourism. I stayed at the Mons Youth Hostel which is a modern and well-run hostel in the old city area. On my way to Cologne I made sure that I got a train that went via Liège. 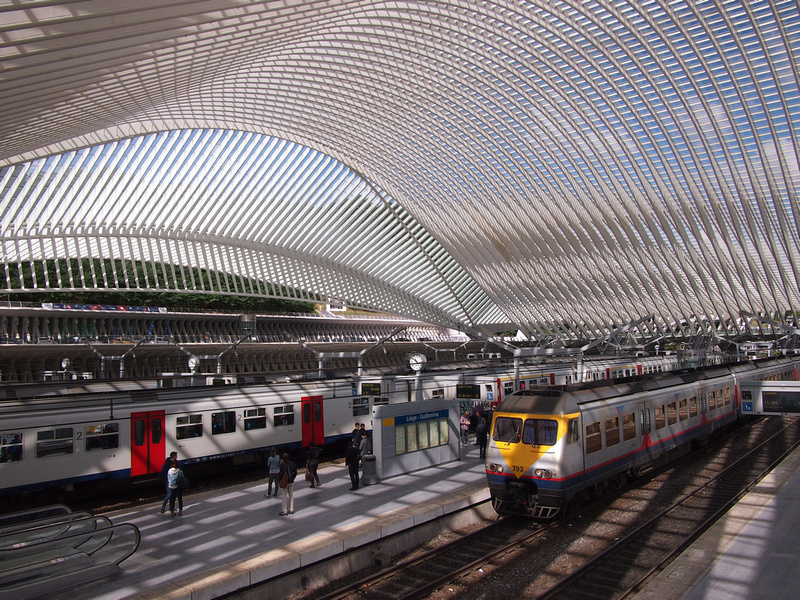 I have visited Liège before, but this time I wanted nothing more than to get out of the train and admire Calatrava’s Liège-Guillemins train station. At Mons, where I had started the day, the station was a mess of construction as it was also getting its own Calatrava-designed station. Did they complain that they didn’t have a Calatrava and they wanted one too? Now I have to go back through Mons at some point to see this station. My rail day ended at Cologne, which was another hub city that I have stayed in before. 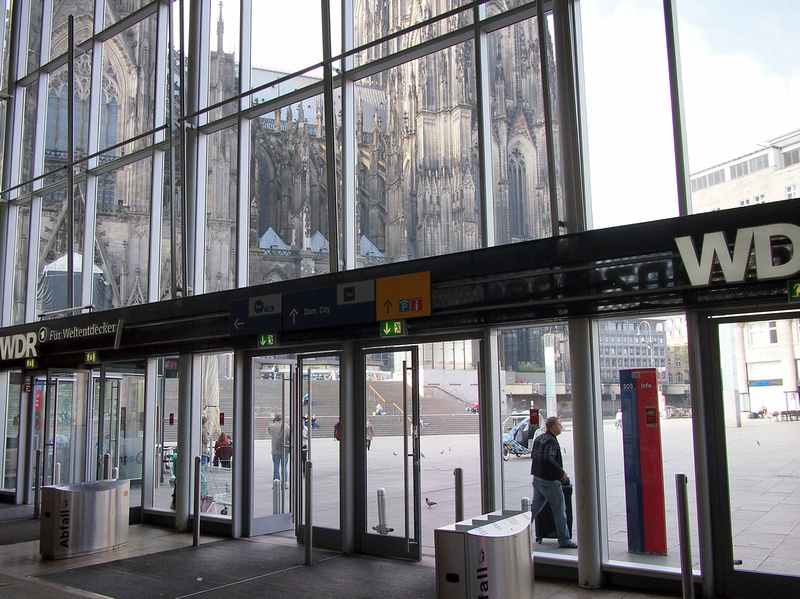 It’s a good base for travelling around North Rhine-Westphalia, and Cologne Hauptbahnhof has plenty of transport connections. I love walking out of the station and seeing the giant cathedral. I know I’ve said this before about other cathedrals, but this really is one of the most magnificent cathedrals in Europe. 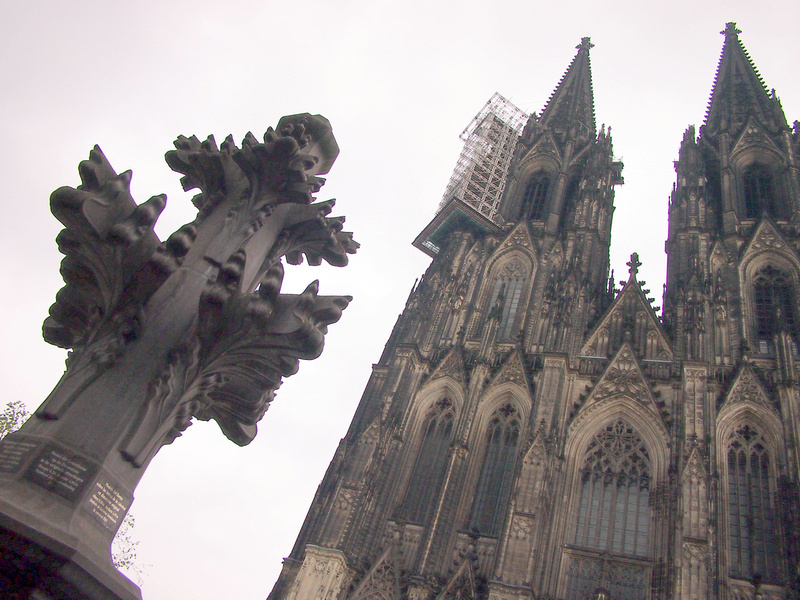 Considering that so much of Cologne was destroyed in the war it was fortunate that so much of the cathedral survived. 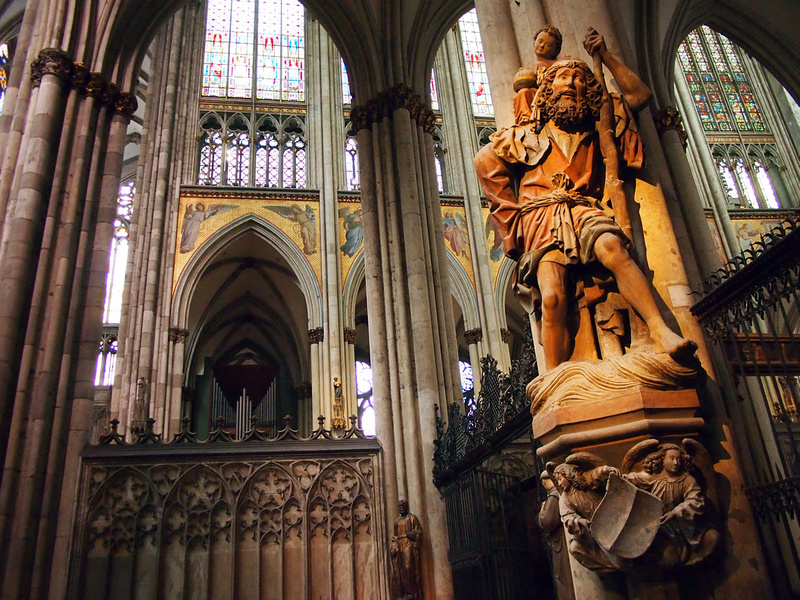 I remembered there being a beautiful statue of St Christopher, the most famous of the patron saints of travel. I figured this was a good place to light a candle, just in case. I stayed at the Station Hostel Backpackers, which is around the corner from the station. As I was staying in Cologne for another night I didn’t have a set plan for today, so I turned up to the station to consider my options. 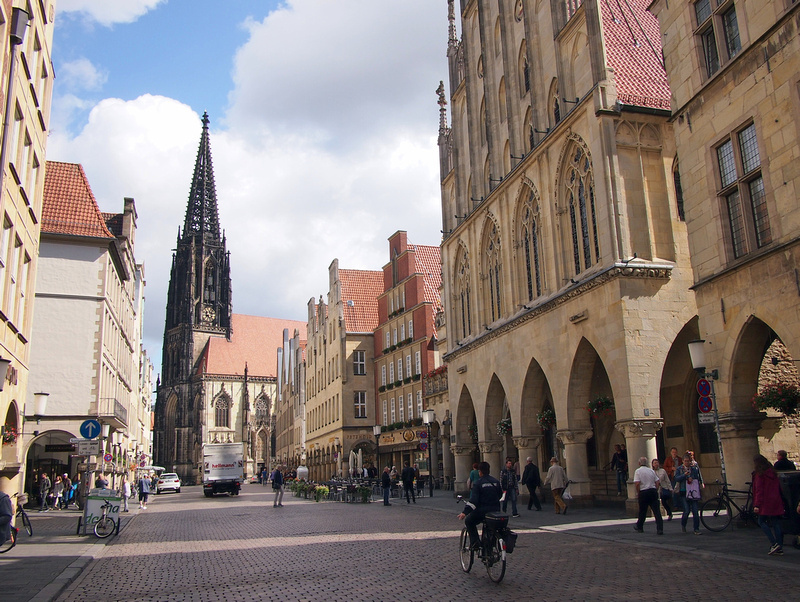 Muenster is a cultural centre of the region with a large student population. 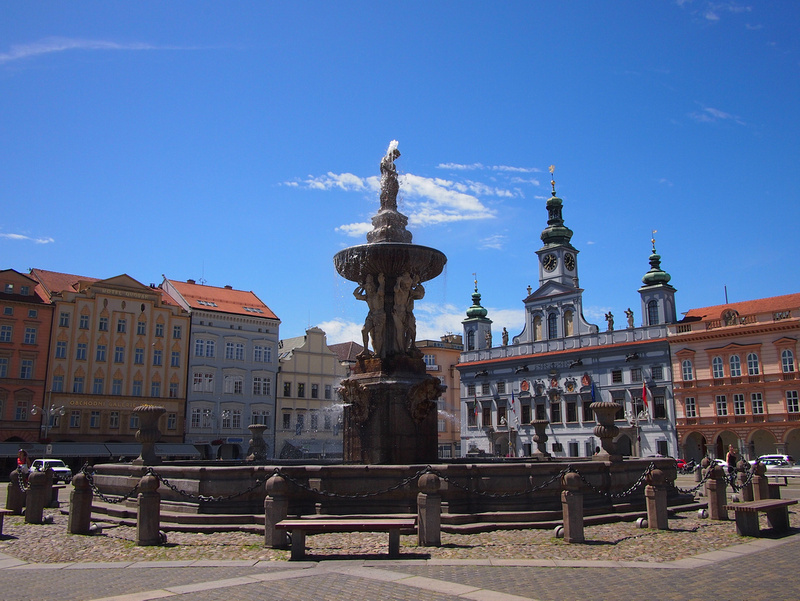 Its old town centre was largely destroyed in the war and it has been rebuilt to somewhat resemble its pre-war state, which is still better than concrete brutalism that was used in other bombed-out cities. 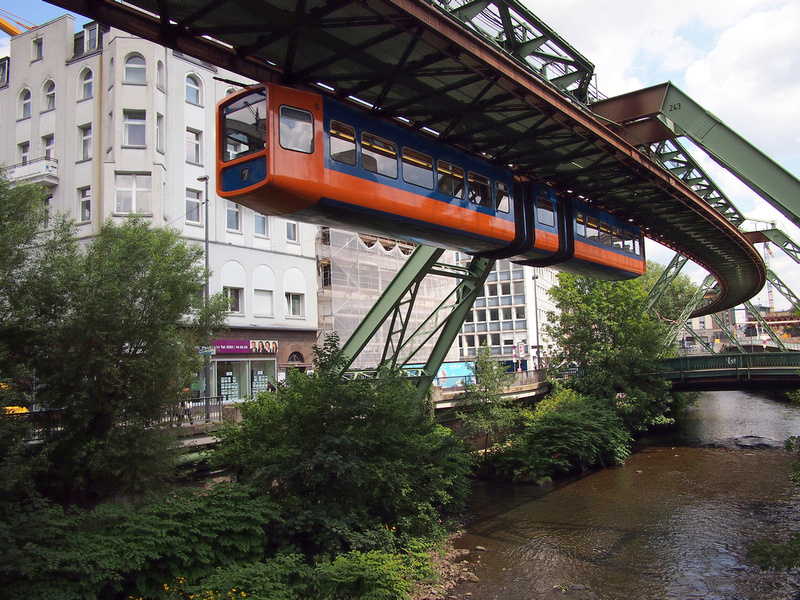 My next stop was Wuppertal, which I visited to see the Schwebebahn; an elevated railway with hanging cars. This floating tram/upside-down railway is the only one of its kind in the world. It follows the path of a river which weaves through the city, and this metro system is a tourist attraction in its own right. 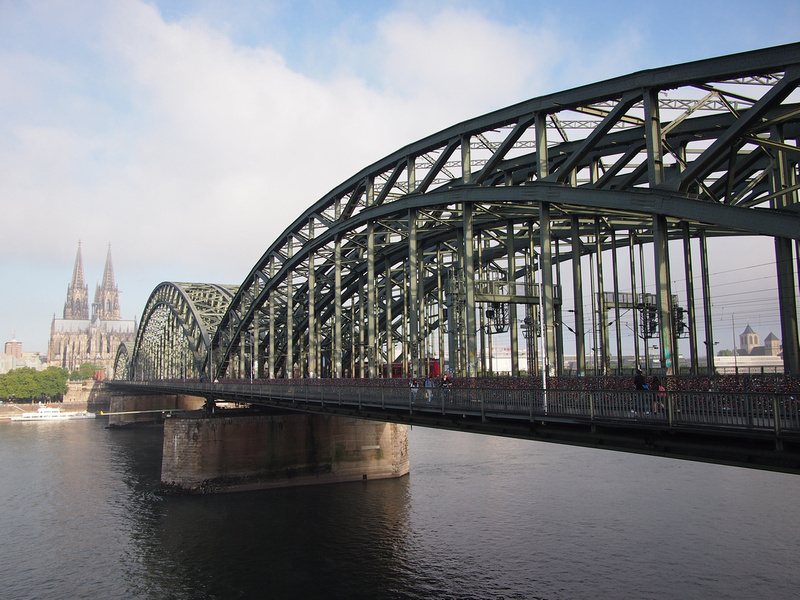 Back to Cologne and cross over the Hohenzollern Bridge which offers one of the best views of the cathedral. It makes for a good walk to get this view. 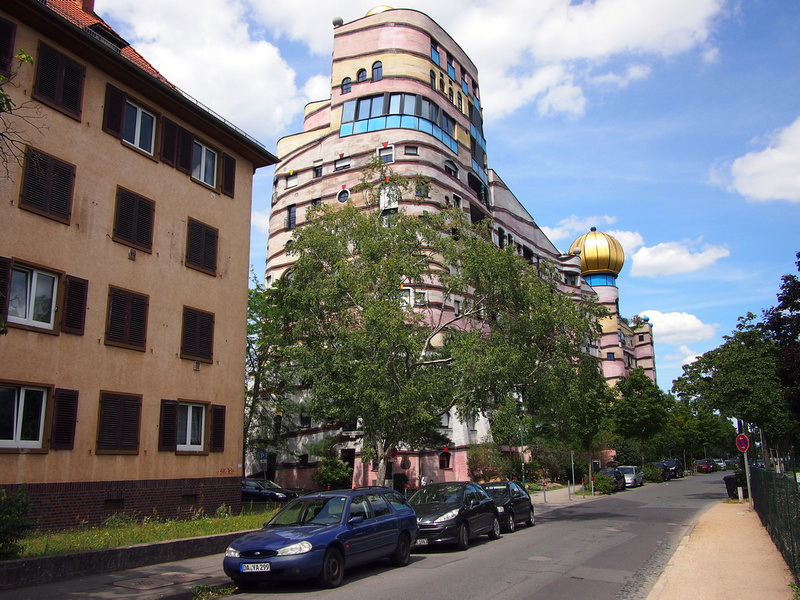 While I was researching Hundertwasser locations I discovered there was another one in Darmstadt, near Frankfurt. Behold! The Forest Spiral of Darmstadt. 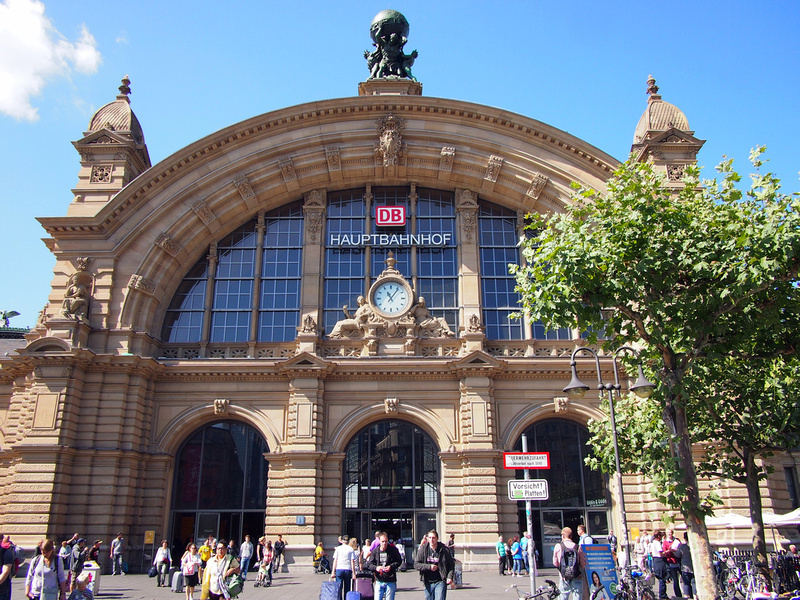 Frankfurt is a major transport hub in Germany and accordingly it has a magnificent Hauptbahnhof. 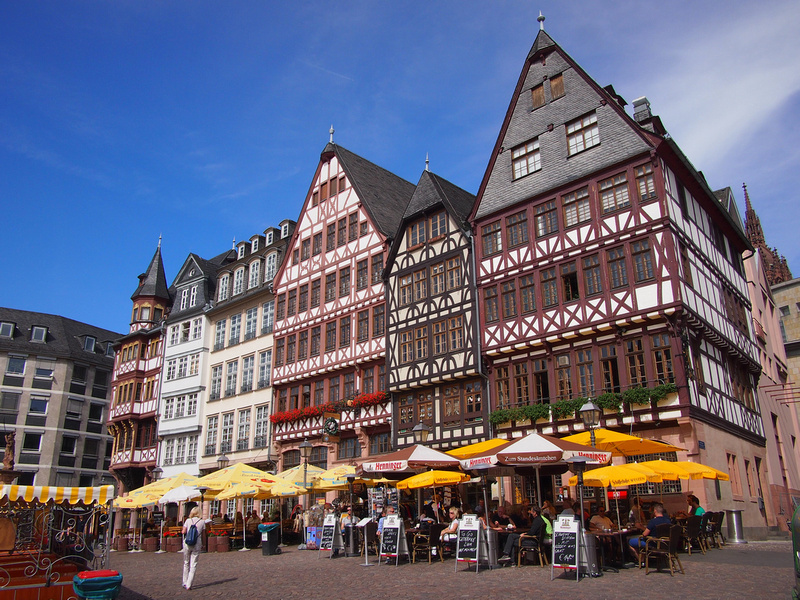 Like many old cities in Germany it has a reconstituted old town that was rebuilt after the war. Frankfurt isn’t exactly a secondary city but by now I had to make a path to my final destination. I had left the last few days of my pass open and found that my accommodation options were limited in other places I was considering. If you are visiting Europe in the summer it pays to plan in advance. I stayed at the Meininger Hotel Frankfurt/Main Messe. This was the same hotel group I stayed with in Salzburg and once again another quality independent hostel. On my penultimate day of this month of rail travel I stayed in Augsburg. It’s about half an hour from Munich and it is a good alternative place to stay if Munich is booked out (like during Octoberfest). I stayed at the Übernacht Hostel which was a good budget option within walking distance of the train station. Sigh. The trip from Augsburg to Budapest was the final day of my pass. I was trying to savour the moment as each kilometre went by, knowing that this great month of living on the rails was about to come to an end. The train arrived at Budapest Keleti station, a grand old station that I am familiar with. I used to be based in Budapest as it’s a good place to work and live. I walked to my Airbnb apartment where I would be based for 5 days. I looked forward to staying still for a few days, yet I was feeling a bit of post-Eurail sadness. Before I started this trip I wondered if one month of travel would be too long. Instead it turned out to be not long enough and I was already dreaming about one day doing the three month Eurail Pass. A one month Eurail Global Pass is €926 for 26 years and over, which is a compulsory 1st class ticket. For 12 to 25 year olds, the one month pass is €604 for 2nd class travel. I thought it wasn’t fair that the Adult pass is compulsory 1st class, but once you start travelling in 1st class you come to appreciate the space and fewer passengers. The Adult pass works out to €29.87 per day over 31 days, which you will easily make that up if you are travelling mostly in Western Europe, as I did on this trip. For those on the Youth Pass you will make back your ticket cost much sooner. In all I used the pass for 28 days out of 31, and only paid one supplement (Zaragoza to Bilbao, which was an additional €6.75). With careful planning you can avoid paying any supplements. My pass was provided by Eurail, and nomadicnotes.com is an affiliate of Eurail.com.